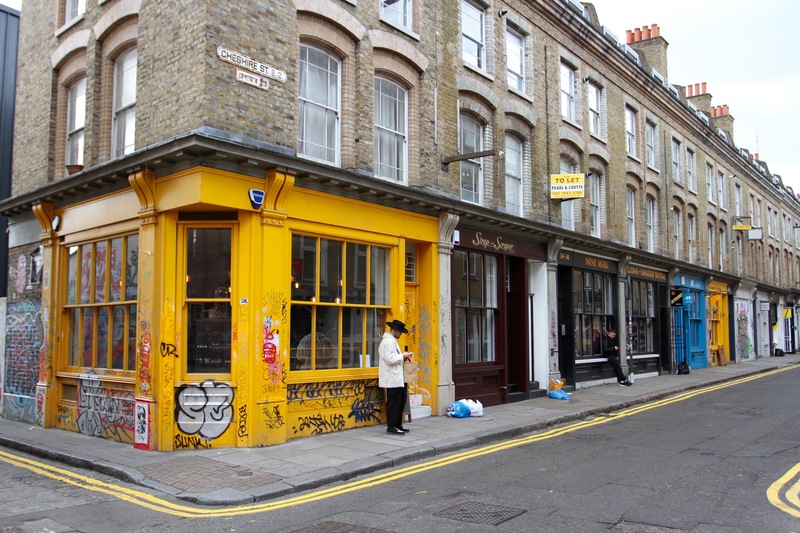 We went our separate ways, and I walked towards Shoreditch High Street and Brick Lane. This area has changed dramatically over the last few years, and now hosts more painfully trendy, upmarket bars, restaurants and private members clubs than you can shake a stick at. Prices have shot up and the demographics of the area have changed accordingly. 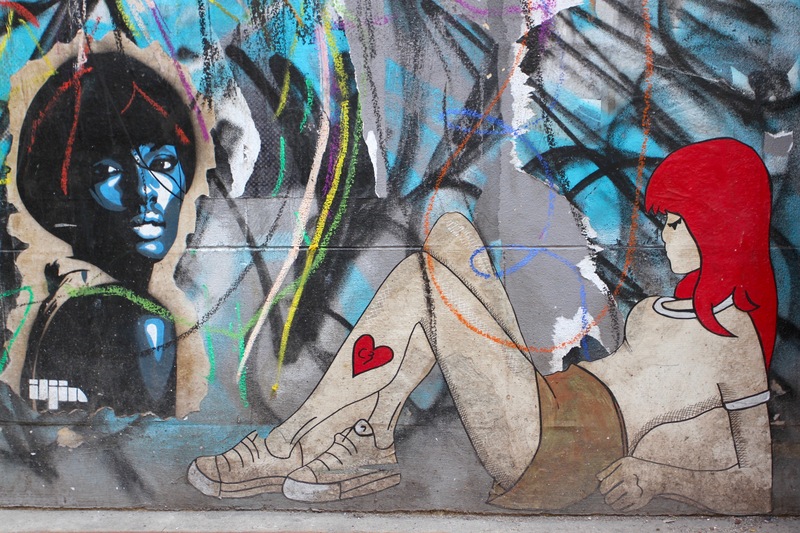 It’s still a haunt for street artists though, and the area’s walls provide a rich canvass for expression. 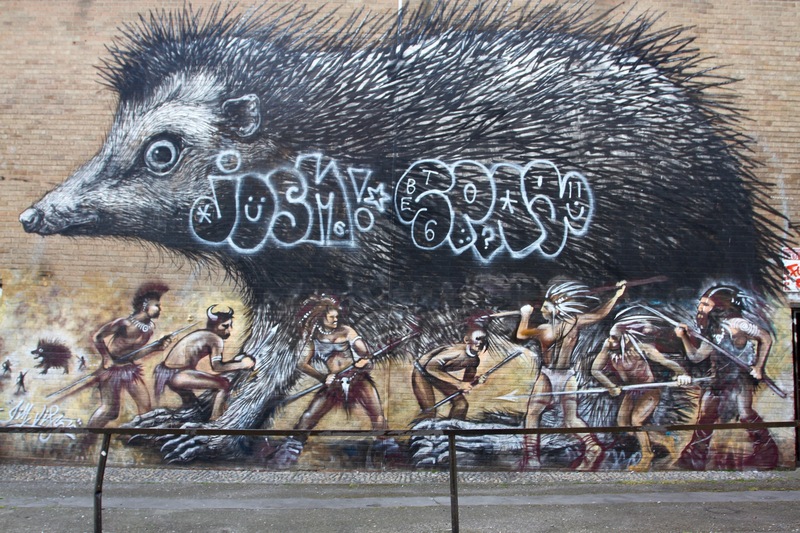 It’s an area that has had a long association with street art. 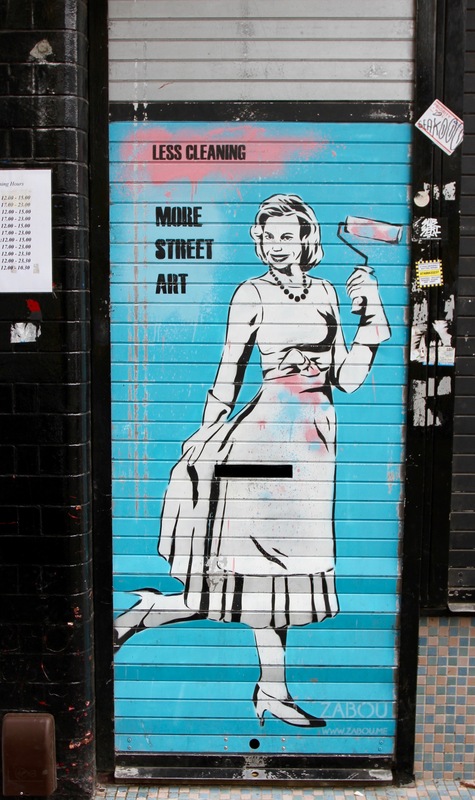 When I lived in the area seventeen years ago it was home to numerous Banksy artworks, including a dribbled white line of paint along Curtain Road that led into an alleyway where a cocaine snorting policeman was painted on a wall. 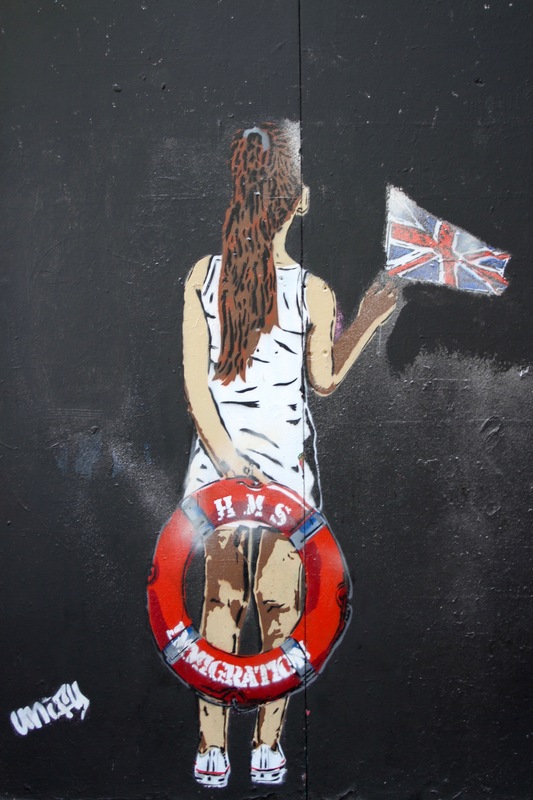 More famous were Banksy’s acid house policemen on the railway bridge over Old Street. 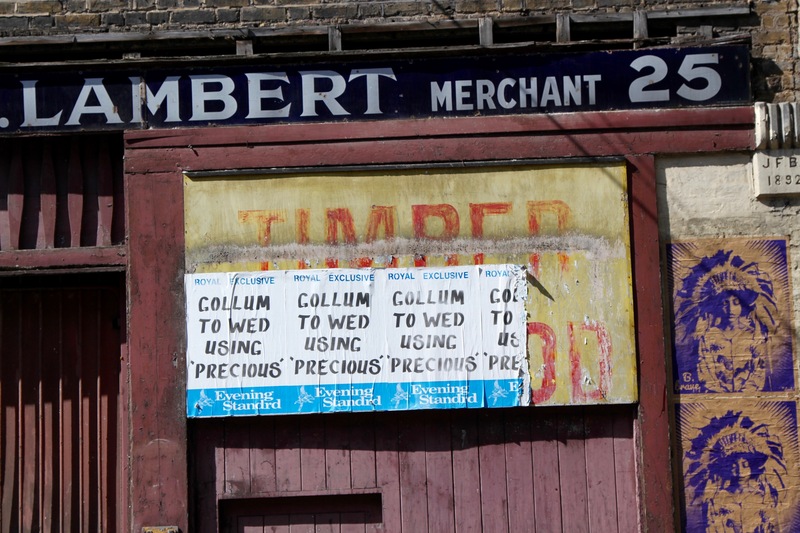 Like all of life’s transient pleasures, both vanished, removed by Hackney Council. 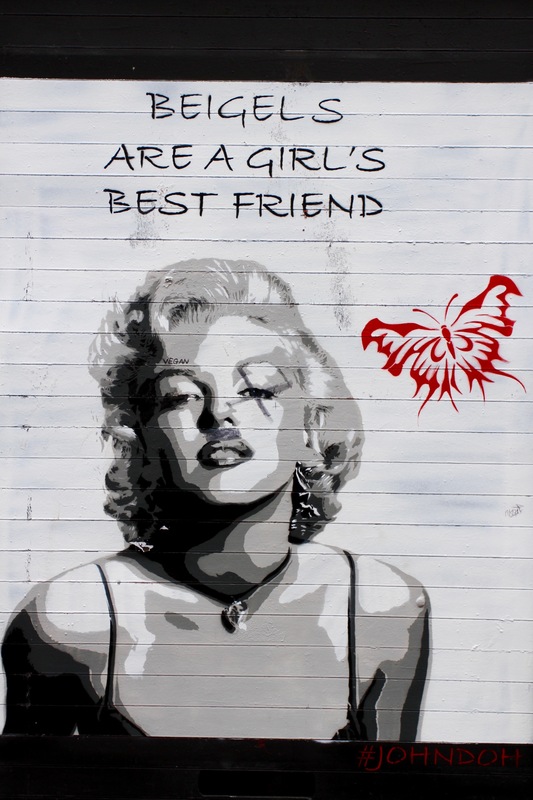 You don’t see so many Banksy pieces any more, his fame has driven up their value and many have been torn from walls and sold. 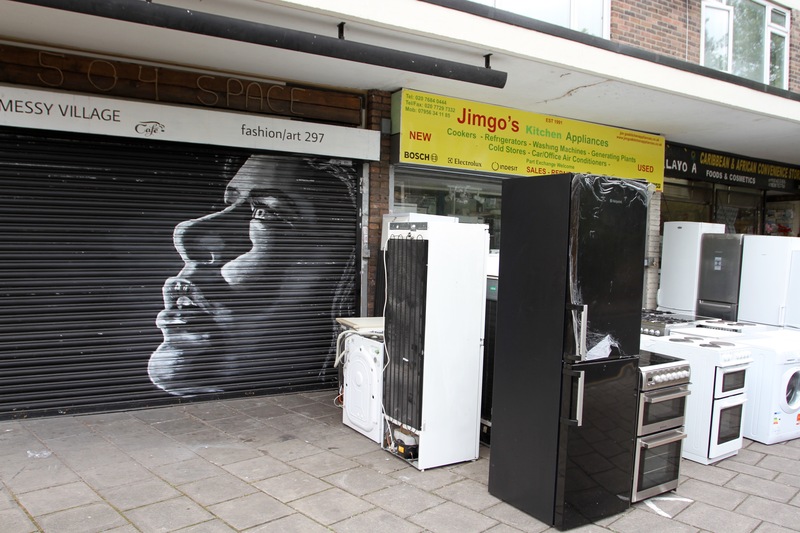 You do see a diverse range of other street artists though, and they have lent the area a new dynamism. 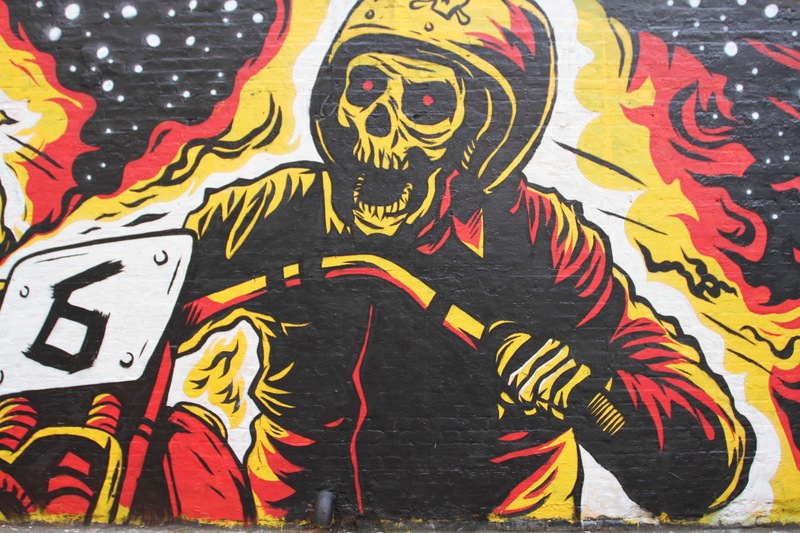 So much so, that you’re fairly likely to bump into walking tours taking people around the area’s street art highlights. 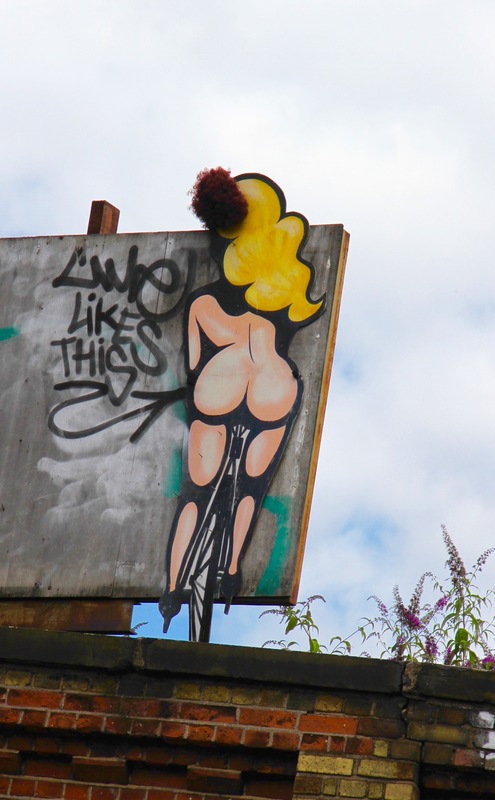 Street art in Hackney was always complemented by commercial art. 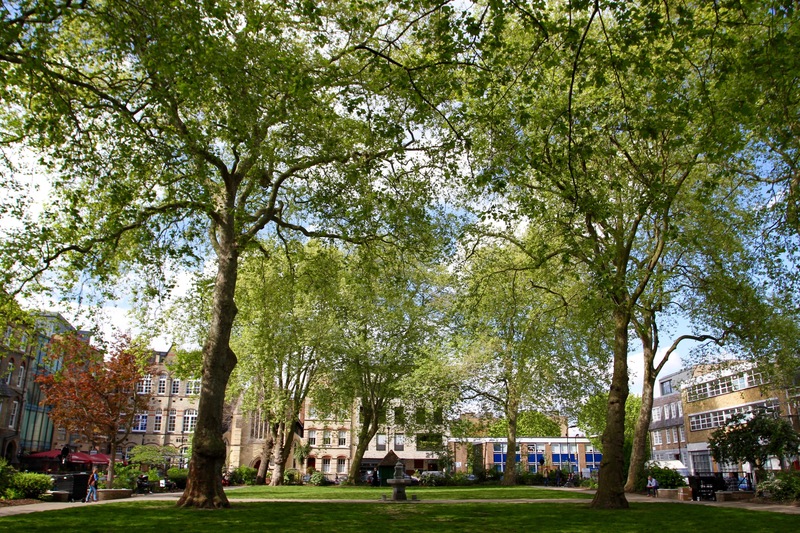 Hoxton Square was home to Jay Joplin’s White Cube gallery, which did much to encourage an infamous crop of Young British Artists like Tracey Emin, Gilbert & George, Anthony Gormley and Damien Hirst. 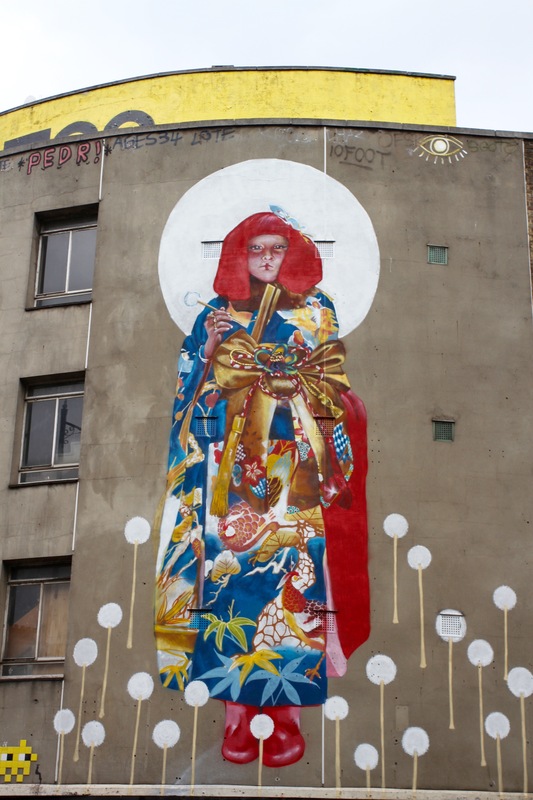 The area is still home to plenty of independent art galleries, but rising property prices have pushed many young artists out of the area. 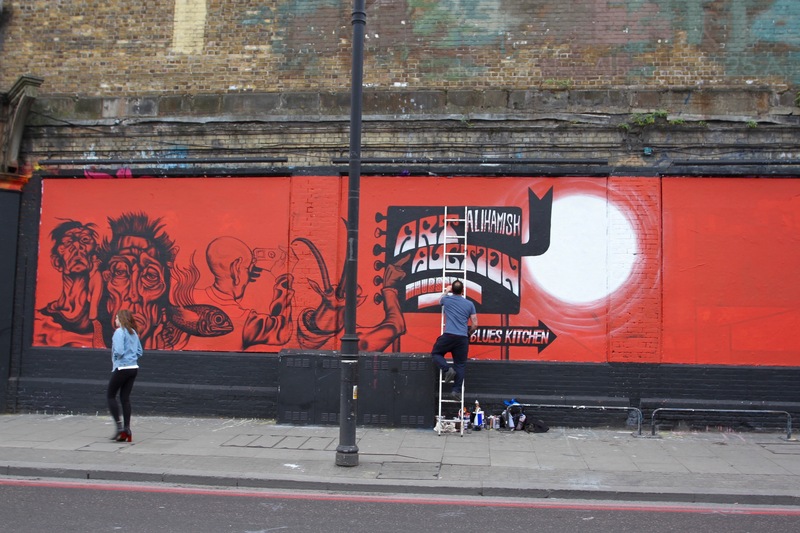 On Great Eastern Street, hoardings around building works had been turned into a temporary canvas. I took a few photos and noticed a security guard walking towards me. I thought I might be in trouble (some ridiculous companies report photographers to the police, or demand photos be deleted because of terrorism fears). It transpired that he just wanted a chat. 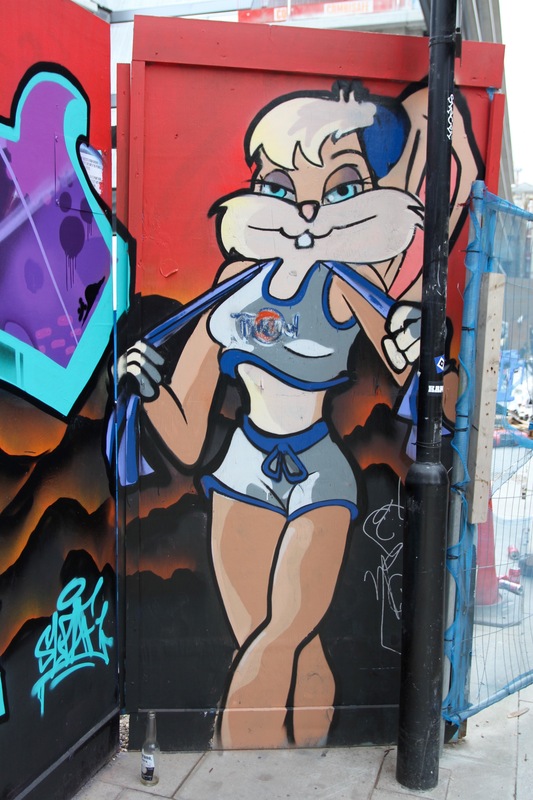 He said the graffiti changed most nights, and thought the painting of a rabbit-person was the only interesting piece. 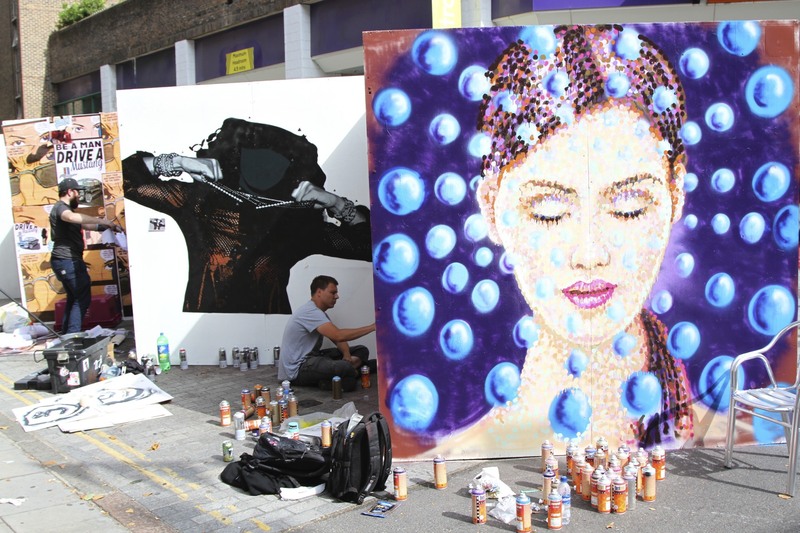 Later, in the streets surrounding Brick Lane, I came across a feast of ever-changing art. 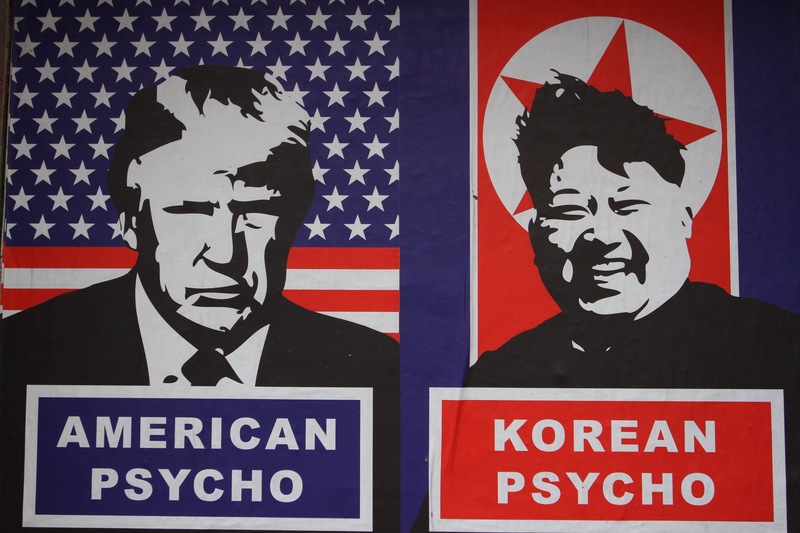 I bumped into a fellow street art aficionado, who turned out to be a lecturer at a Tel Aviv university. 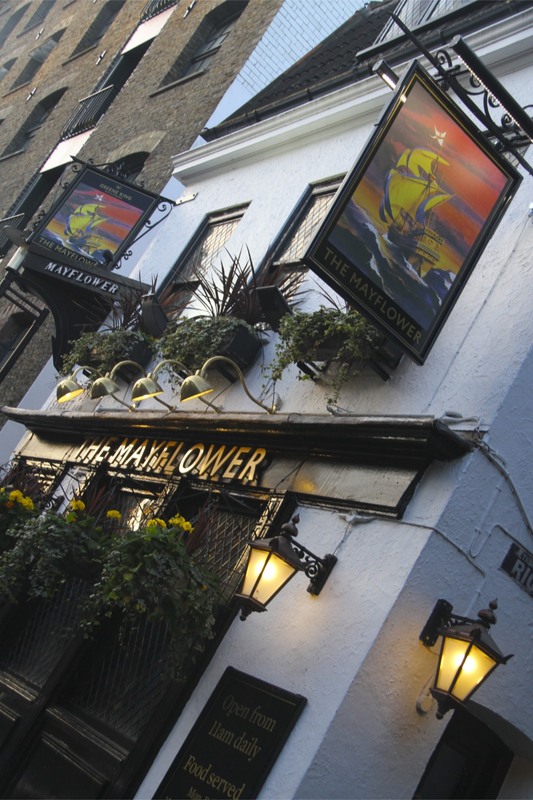 We compared notes from around the world, and agreed this area of London was pretty special. 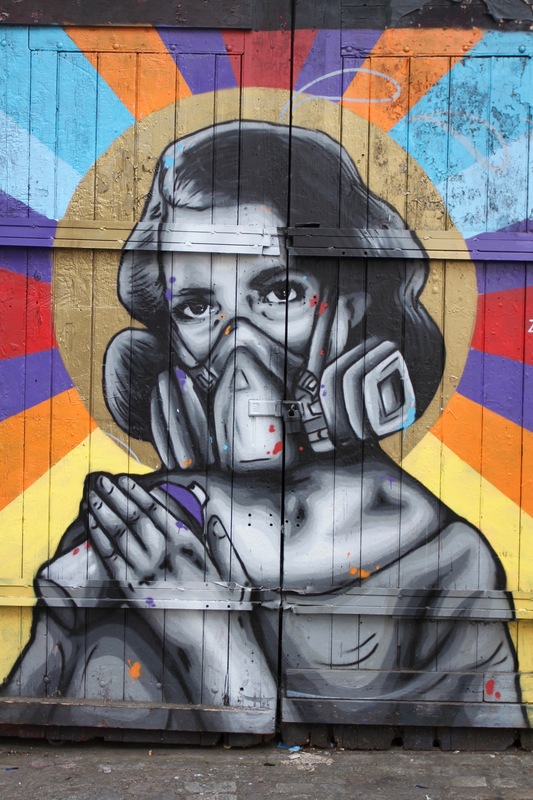 I made my way back along Brick Lane and, my day of street art spotting over, went to get a real ale in one of the area’s nicest pubs, The Carpenter’s Arms. 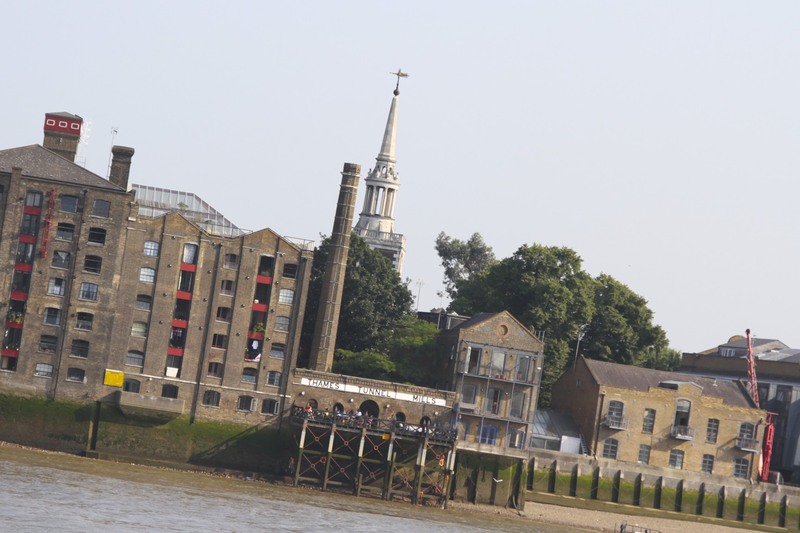 The London Borough of Deptford isn’t on anyone’s tourist top ten of London. It’s hard to imagine that, of the millions of tourists who visit London every year, more than a handful have heard of it. The majority of London’s seven million residents, at least those who don’t live in Deptford, would struggle to pinpoint it on a map. Feeling underwhelmed as I walked the streets, it was easy to understand why it’s one of London’s less loved boroughs. 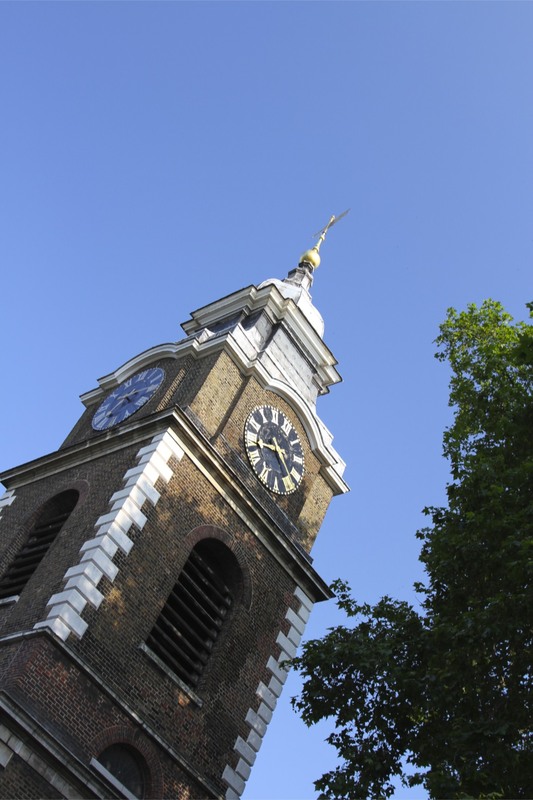 Deptford struggles with high levels of poverty and crime, including a significant level of gang-related crime, and has definitely seen better days. Given this, it is almost impossible to understand why a couple years ago the New York Times enthusiastically encourage Americans to visit the area. 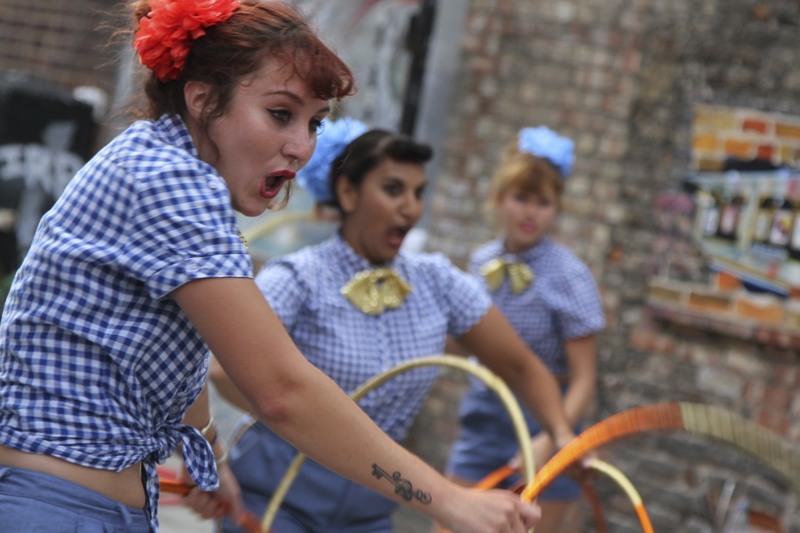 The NYT described Deptford as “a boisterous concoction of blue-collar aesthetics and intermittent hipsterism“. I’m not really sure what this means, but it sounds like the sort of soundbite typically reserved for areas like New York’s East Village. 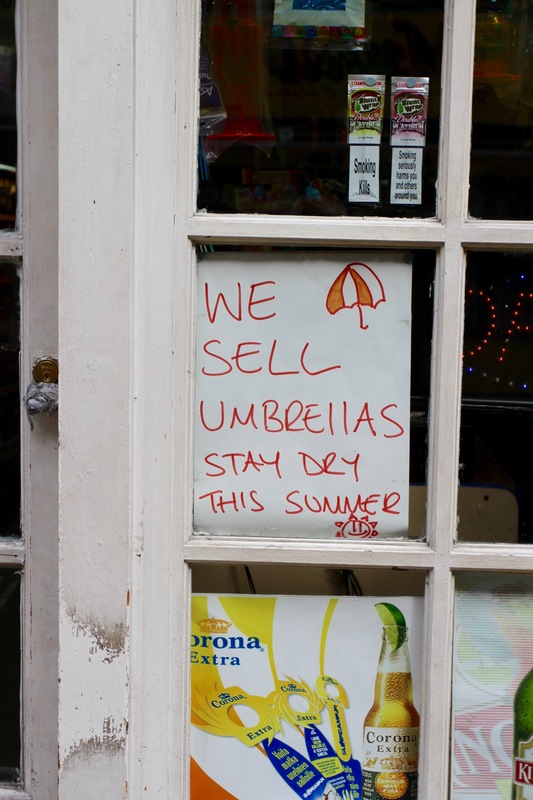 It certainly doesn’t describe the Deptford I encountered. 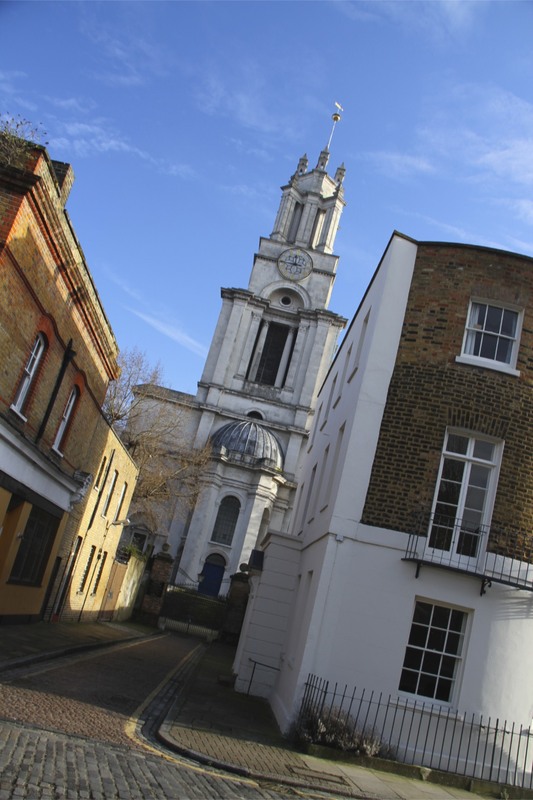 Deptford is now going through a painful process of gentrification, it also has a lot of historical associations. 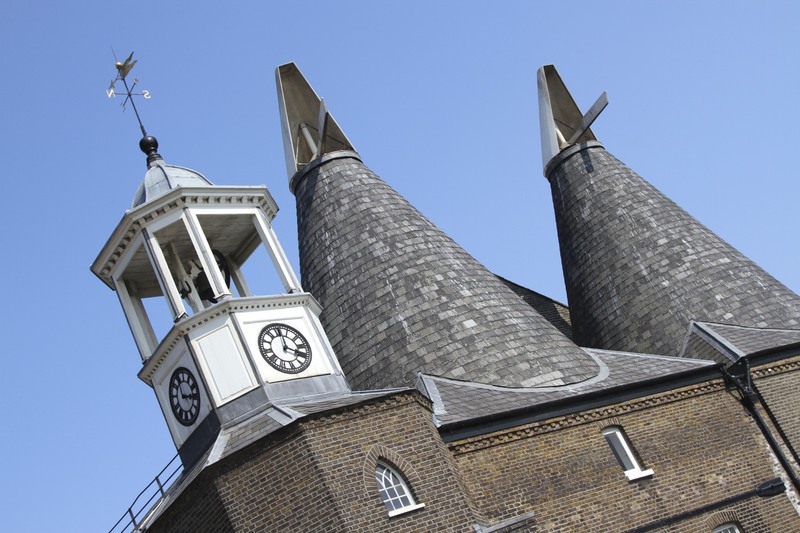 Chosen by King Henry VIII in 1513 as the site of the Royal Naval Dockyard, it is known as the birthplace of the Royal Navy. Queen Elizabeth I knighted Sir Francis Drake here in 1581, following his circumnavigation of the globe in the Golden Hind. 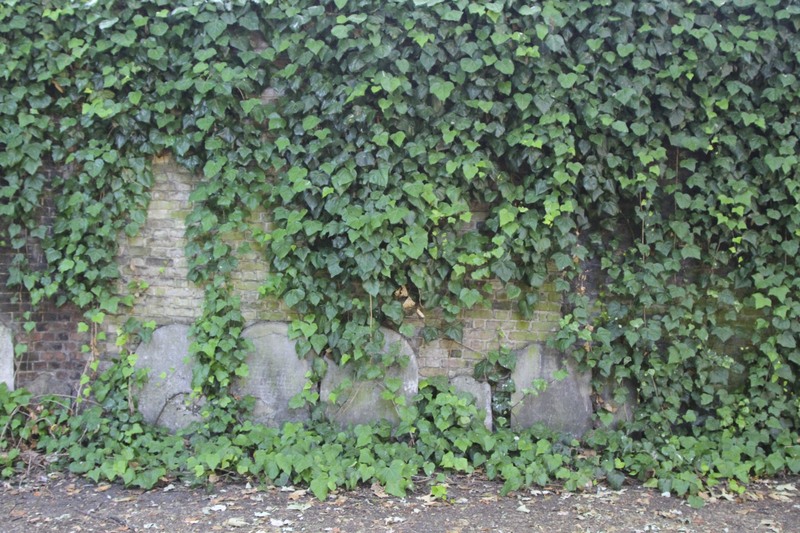 This event is commemorated by a gateway above the Drake Steps, reputed to be where he famously laid his cloak at the feet of the Queen. The Russian Tsar, Peter the Great, stayed in this area when he came to inspect the dockyards in 1698. The dockyards reached their zenith in the 18th and early 19th Centuries as British military and economic power spread around the globe. 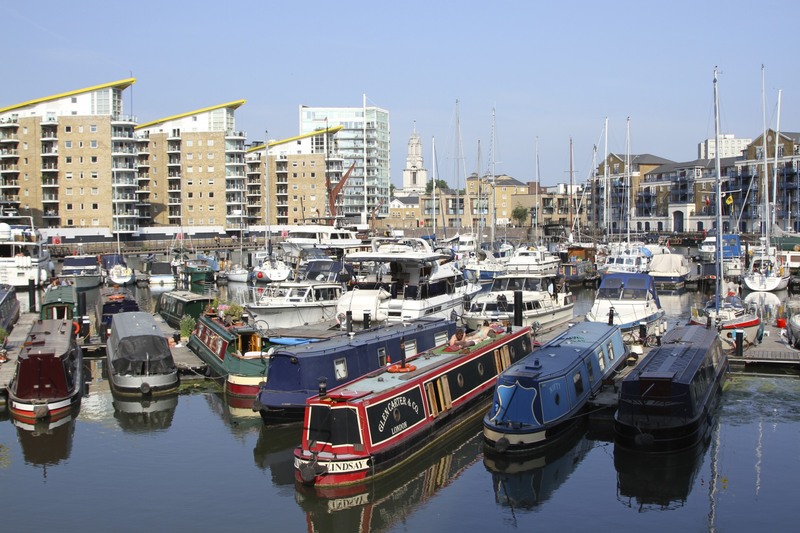 After the end of the Napoleonic Wars in 1815, Deptford’s docks declined in importance. 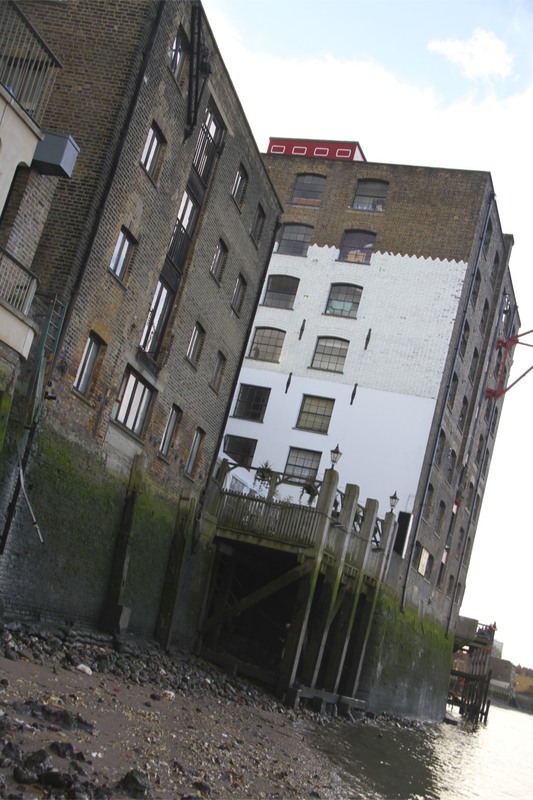 As the docks declined, so to did Deptford; little of this grand history remains today, many of the centuries old buildings destroyed in acts of historical vandalism. 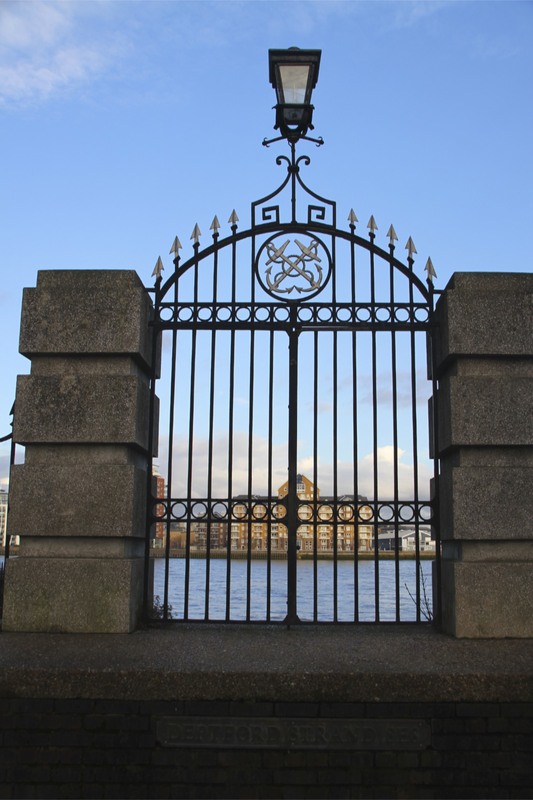 A planned new development of apartments would destroy what remains of the Royal Navy Dockyards. 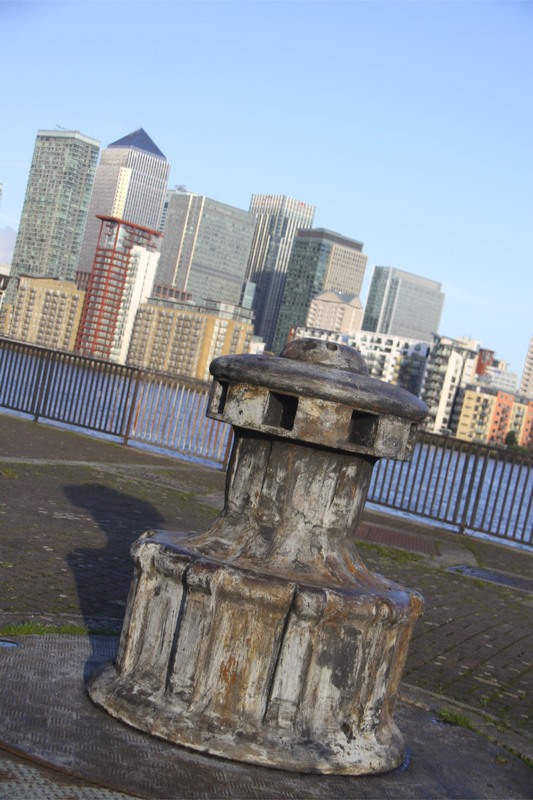 Consigning this history, and tourism potential, to the scrapheap seems poor reward for an area which played an important role in London’s history. There is an alternative vision, supported by local groups: preserve the dock as a heritage site and build a working replica of a 17th Century ship. 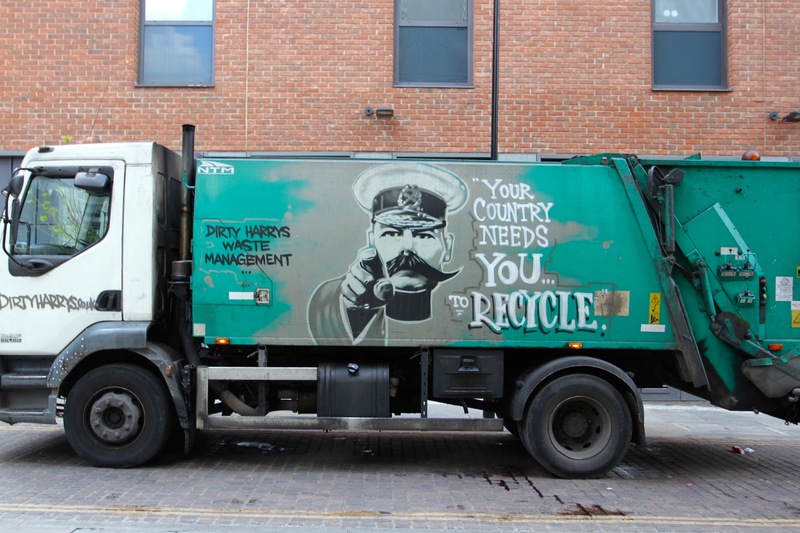 The decision has been taken out of local hands, now resting with London’s clown-like Mayor, Boris Johnson. 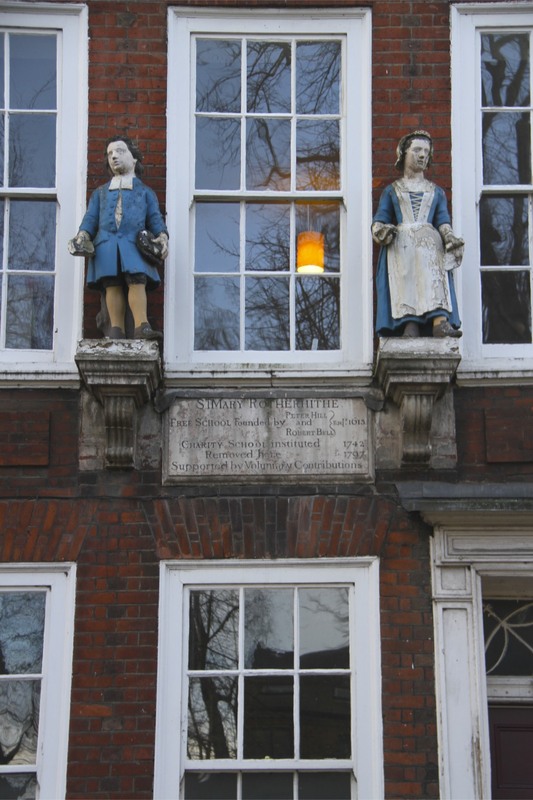 Preserving 500 years of history or a 40-story block of flats. Which way will Boris jump? 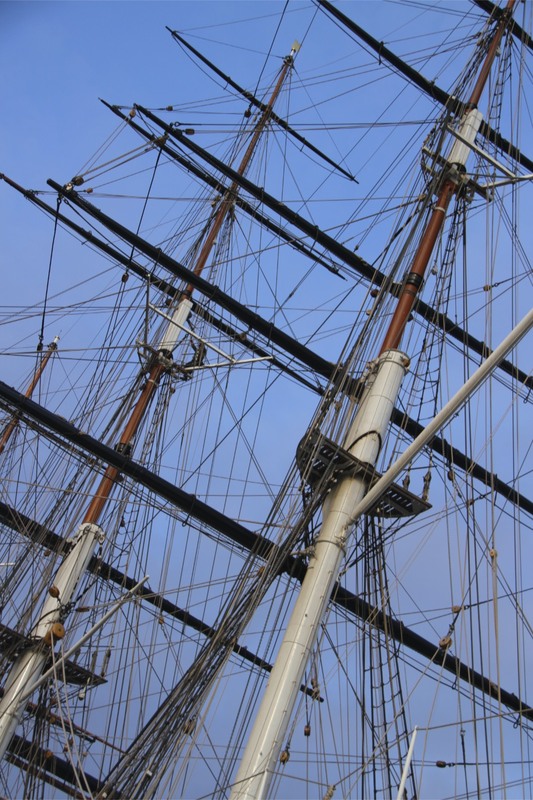 Walking from the much better known Greenwich, and leaving the magnificent Cutty Sark behind, I walked back towards the City of London. 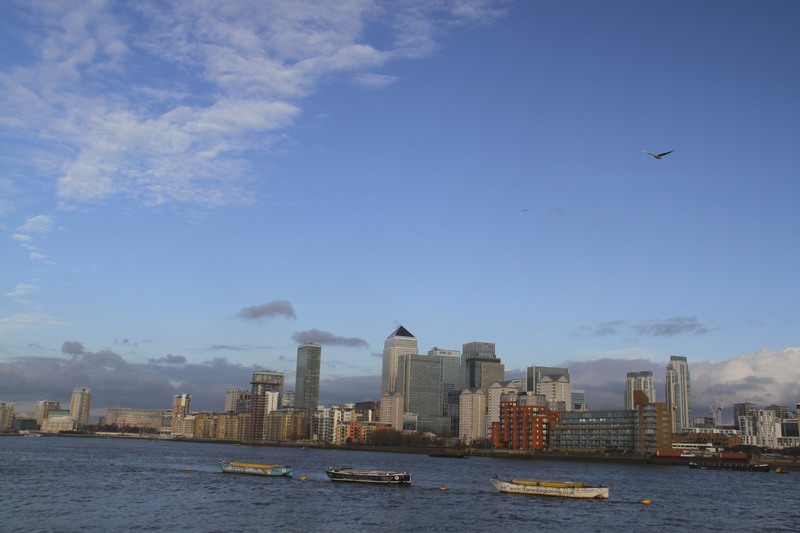 It is a lovely walk, offering spectacular views of Canary Wharf and the river. 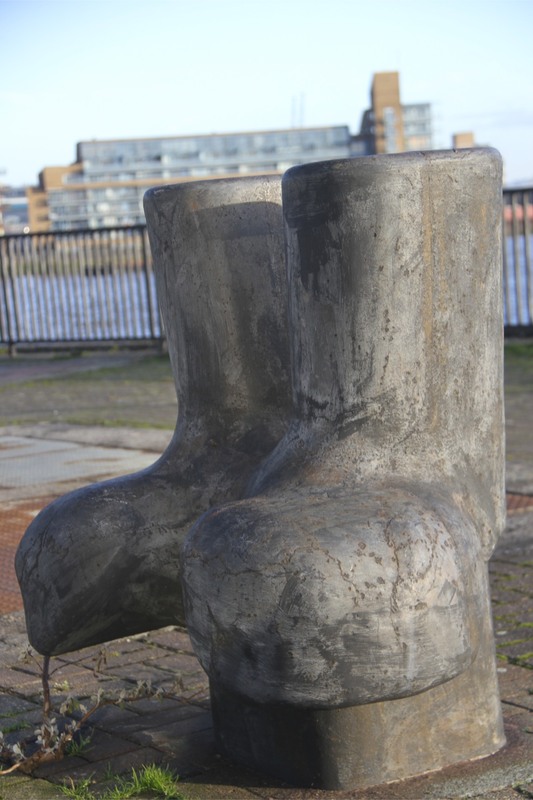 The entire route is littered with the detritus of Britain’s global maritime trade, creating some interesting ‘modern art’ forms along the river. These leftovers are evocative reminders of Britain’s industrial heyday, but you really have to work hard to imagine the area as it would have been – teeming with life and full of ships carrying cargo from around the world. 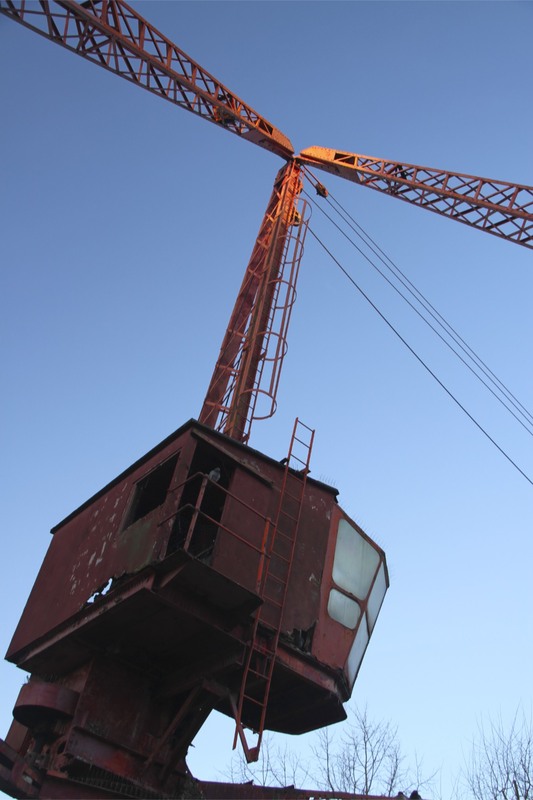 Inland, there are a series of wharfs and docks where ships would load and unload their bounty from around the world. 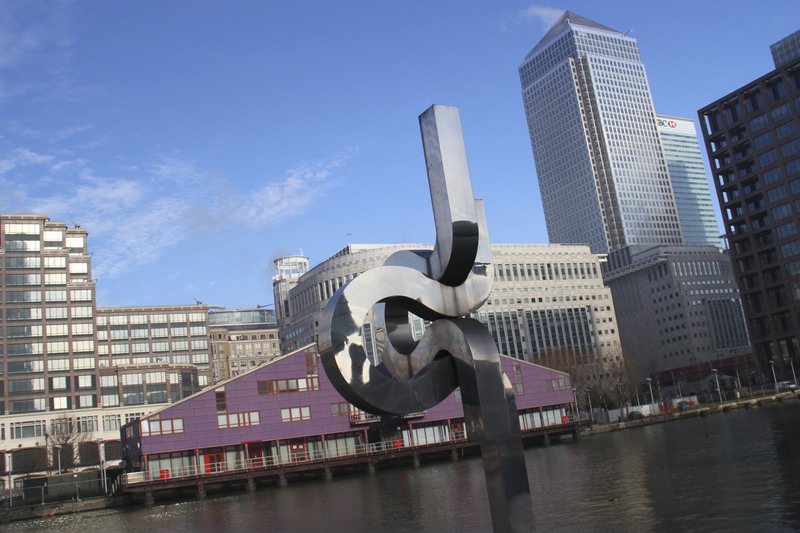 Today, those docks which remain are little more than water features surrounded by apartments, but they provide an insight into the history of this area. 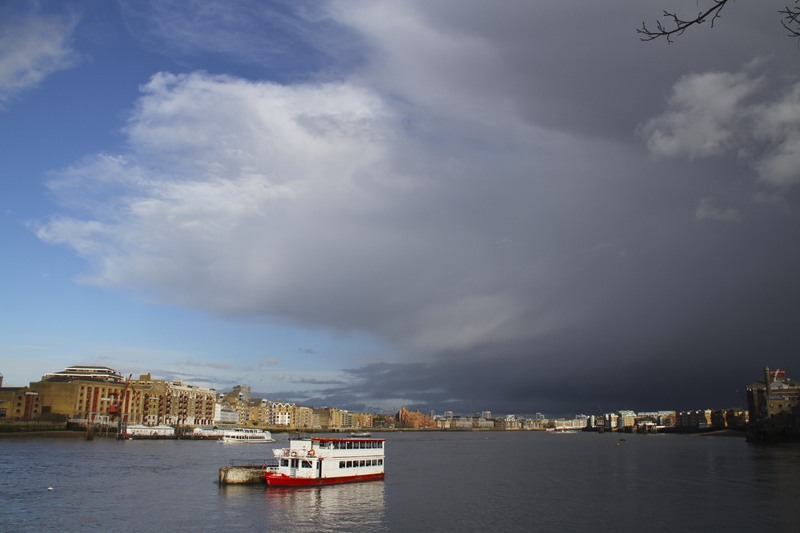 On the border between Deptford and Rotherhithe lies the huge Greenland Dock. 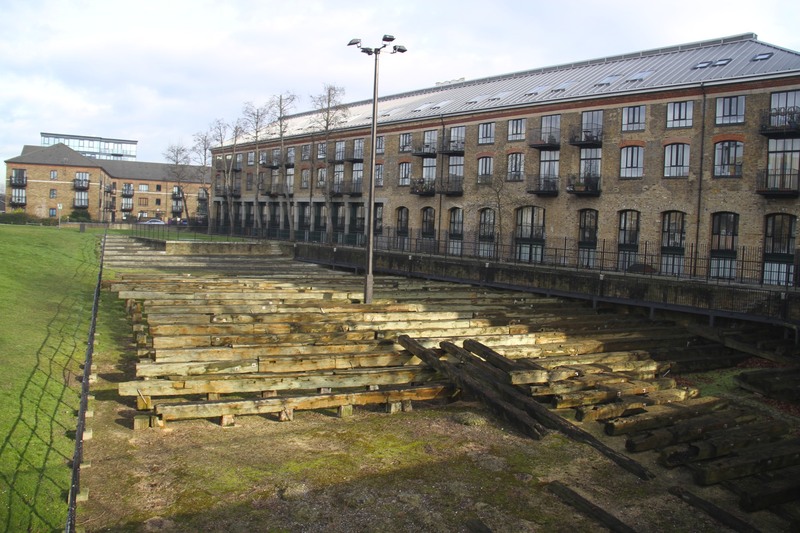 This was once known as Surrey Dock, but was renamed Greenland Dock when it became the centre of trade for whaling ships. 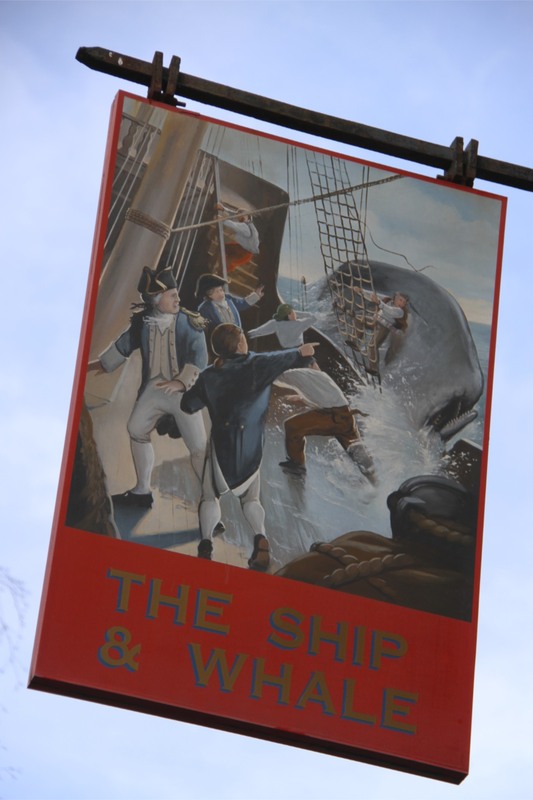 After the decline of the whaling trade, the area was known for timber imported from Russia, Finland and Sweden. 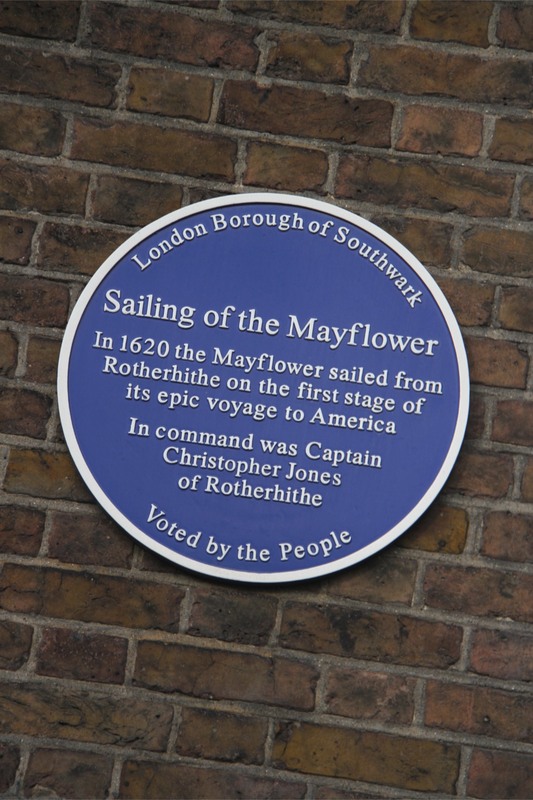 My route eventually reached Rotherhithe, close to Tower Bridge. 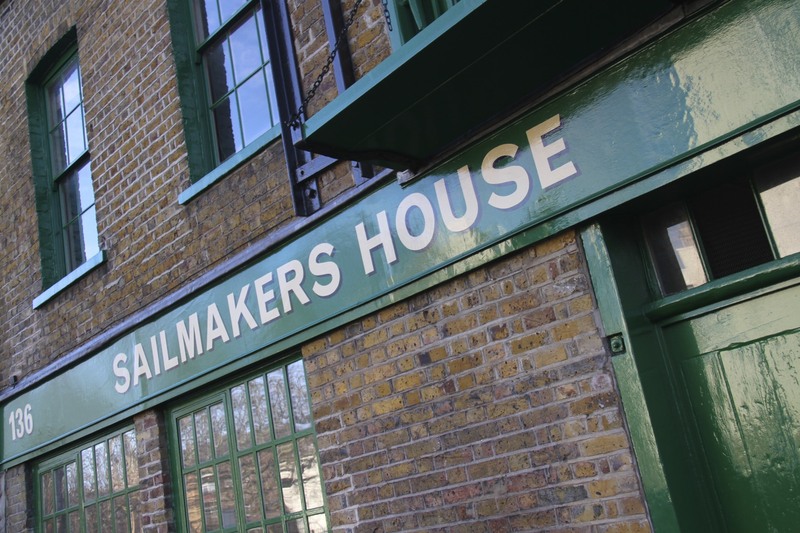 Rotherhithe is a fascinating and historic district where I found myself wandering aimlessly and bumping into some extraordinary history…but that’s for next time. I’m not sure what seems more improbable, an island of dogs or being able to walk under the Thames. 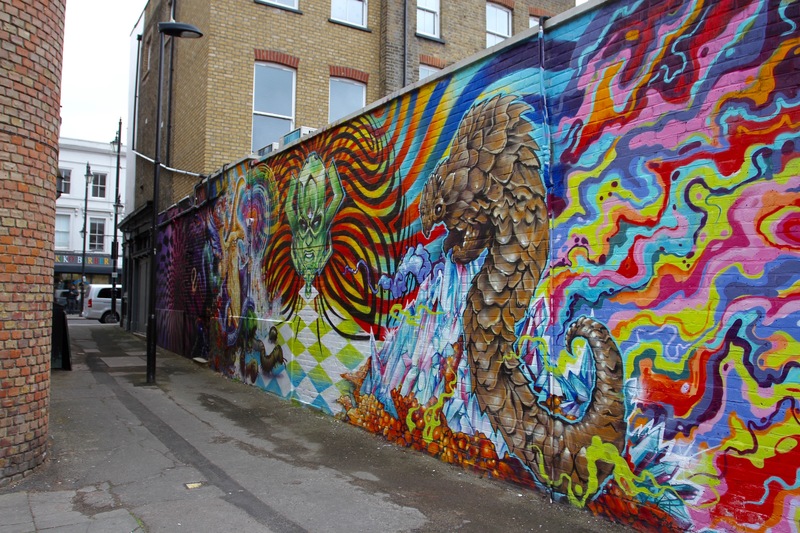 Then again, East London is full of surprises. 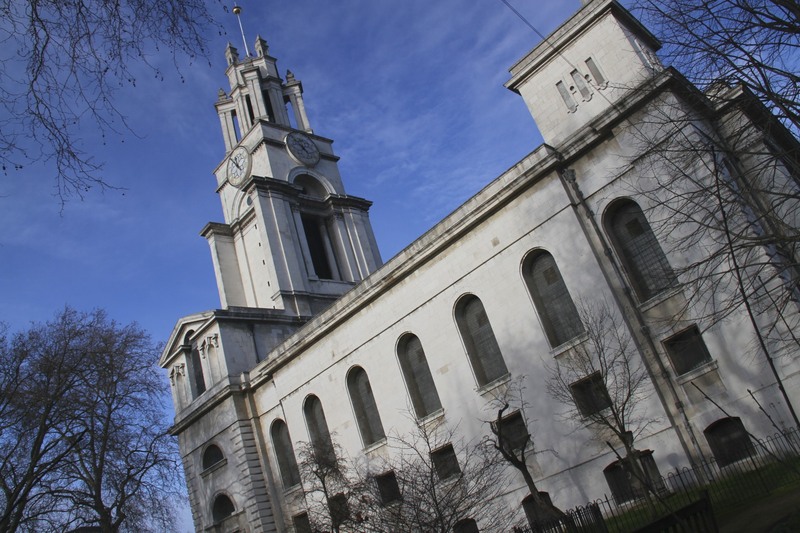 Starting next to the historic and enormous (and closed) Hawksmoor designed St. Anne’s Church, my route passed through Limehouse’s narrow streets to the corporate glass and steel towers of Canary Wharf; arriving at the Cutty Sark in Greenwich via the Thames Path and the marvellous Greenwich Foot Tunnel. 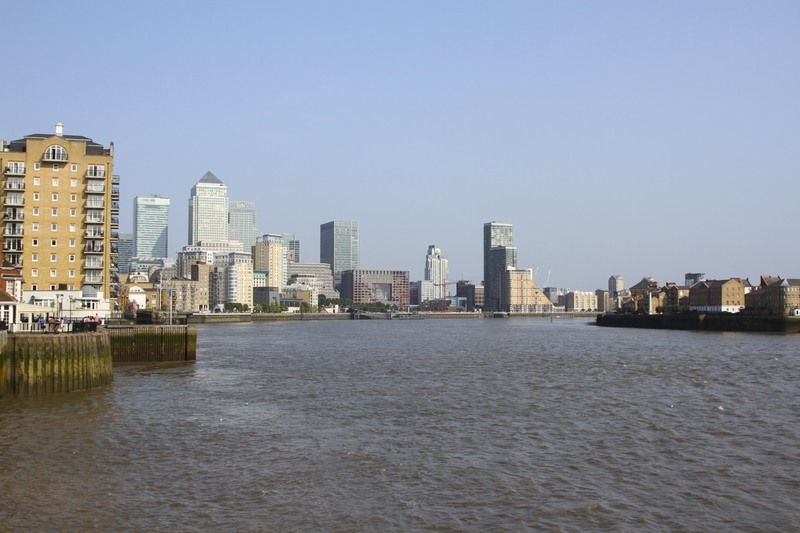 No one really knows the origin of the name ‘Isle of Dogs’ – the great bulge in the River Thames. Theories, however, abound: royal hunting dogs were kept here; a corruption of the name ‘Isle of Ducks’; dead dogs washed up here; a nickname because people who lived here led a ‘dog’s life’. None of which make it sound particularly appealing. While the meaning is lost, the name was in common use by the 16th Century and has stuck. Its almost unimaginable today, but this was a rural area until the 19th Century. Known as Stepney Marsh, it was a wetland criss-crossed by waterways, accessible only by bridge or boat. 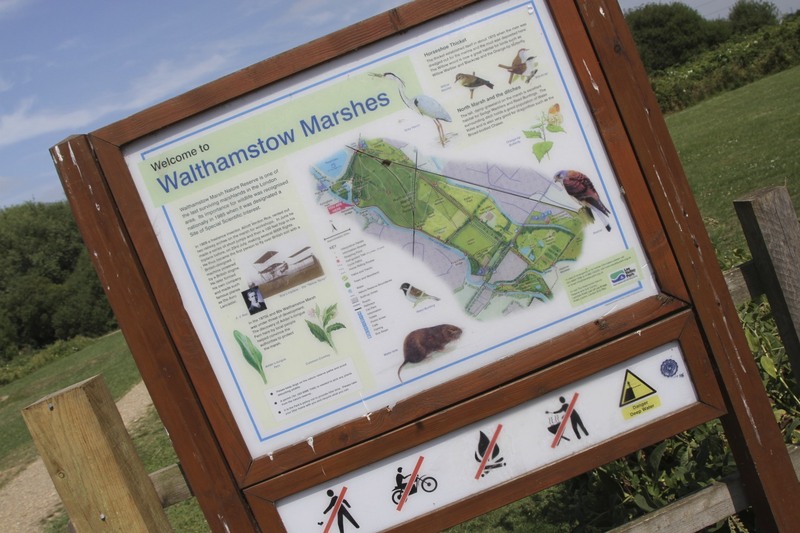 The marsh was drained in the 17th Century, becoming an important agricultural area providing food for London. This all changed in the 19th Century. 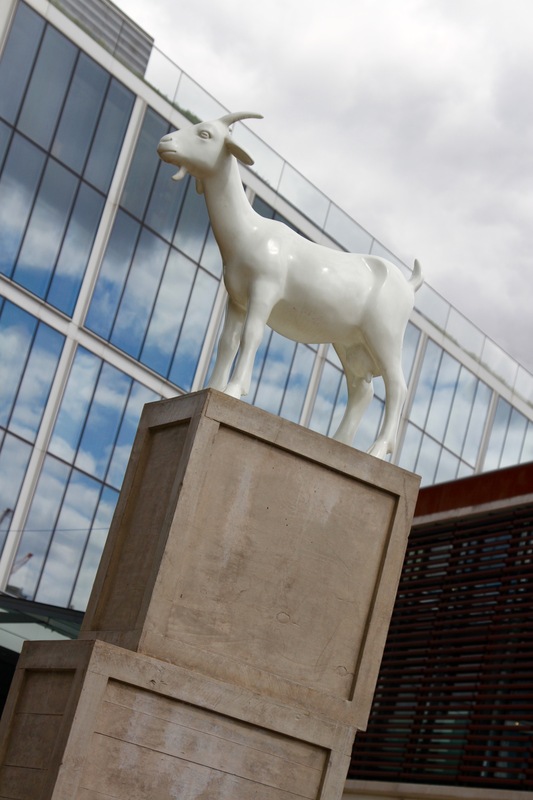 It was transformed from cattle pasture into London’s most industrialised area, teeming with people and activity. Mid-19th Century, this area was the powerhouse of trade and communication with the British Empire. A relationship born witness to by the series of docks and wharfs dotted all over this area, all of which serviced the massive maritime ambitions of the British nation. Trade and Empire can still be recognised in names: West India Dock, Ontario Way, Cuba, Tobago and Malabar Streets. 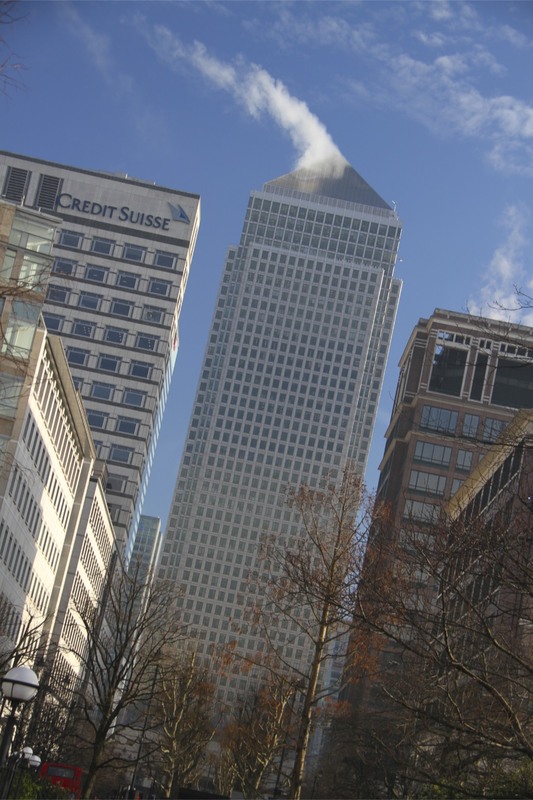 Today those connections are maintained by the international workforce involved in international finance at Canary Wharf. The streets here were lined with wharves and hundreds of warehouses, built to house goods arriving or departing to every corner of the globe; it was the engine of Britain’s economy. 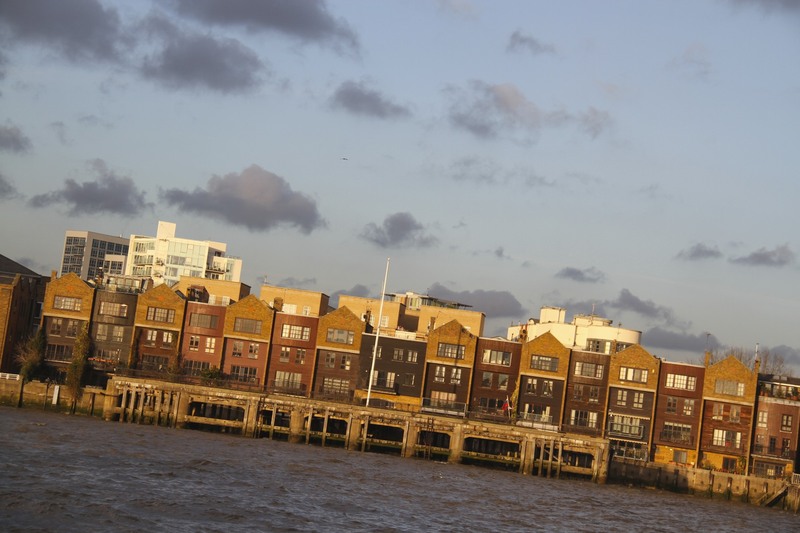 That status made the Isle of Dogs a target in World War II. Starting on 7th September 1940, and continuing for seventy six consecutive nights, this area was bombed with heavy explosives and incendiaries. The Blitz had come to London. The Blitz intended to destroy Britain’s the economy and the nation’s ability to fight. The warehouses and wharves burned for days on end, as did their contents. 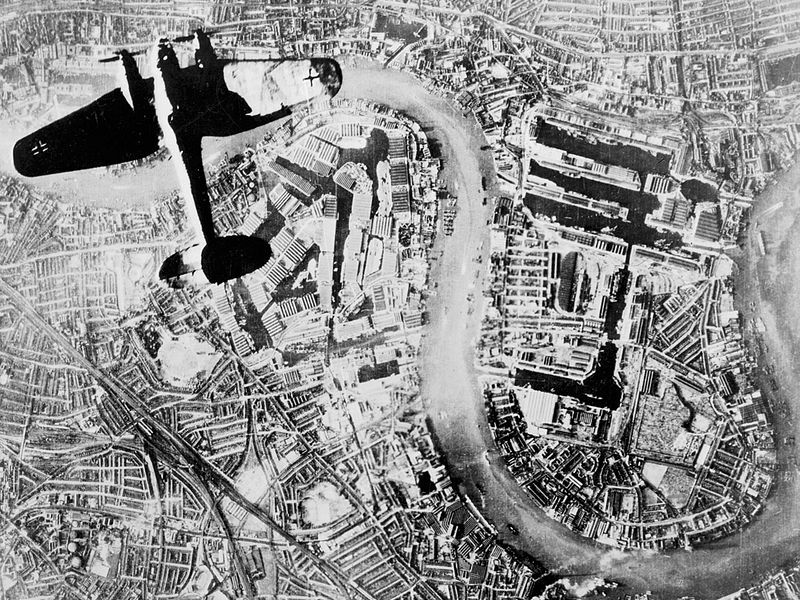 One bombing raid set fire to 380,000 tonnes of timber at Surrey Docks. By the time The Blitz ended a third of the Isle of Dogs’ warehouses, and tens of thousands of homes, had been destroyed. Bombs from World War II continue to be unearthed even today. Ironically, the end of the war was even more destructive for local communities. The end of Empire and shifting global trade made the docks obsolete. Britain was bankrupt and rebuilding was little more than a pipe dream. This area remained – and still is in parts – a severely deprived area. 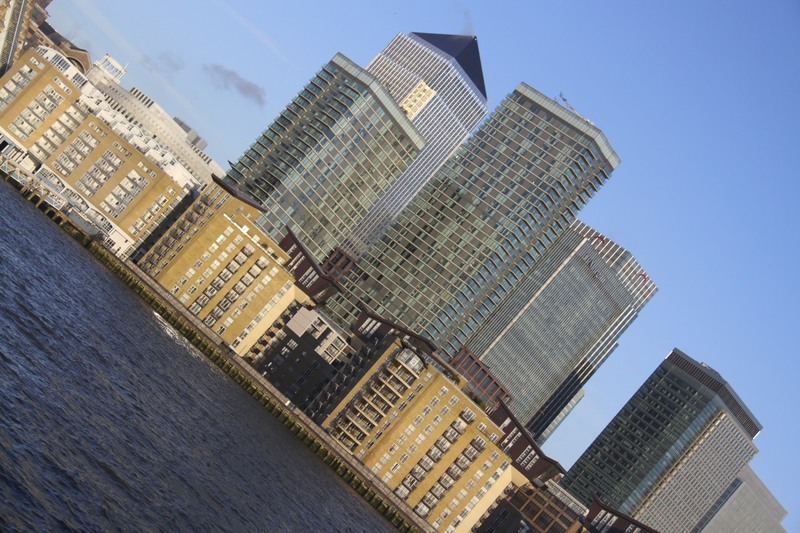 Even the Docklands development of the 1980s, which bequeathed us Canary Wharf, did little to solve entrenched poverty. Along the Thames Path occasional signs impart bits of forgotten history. 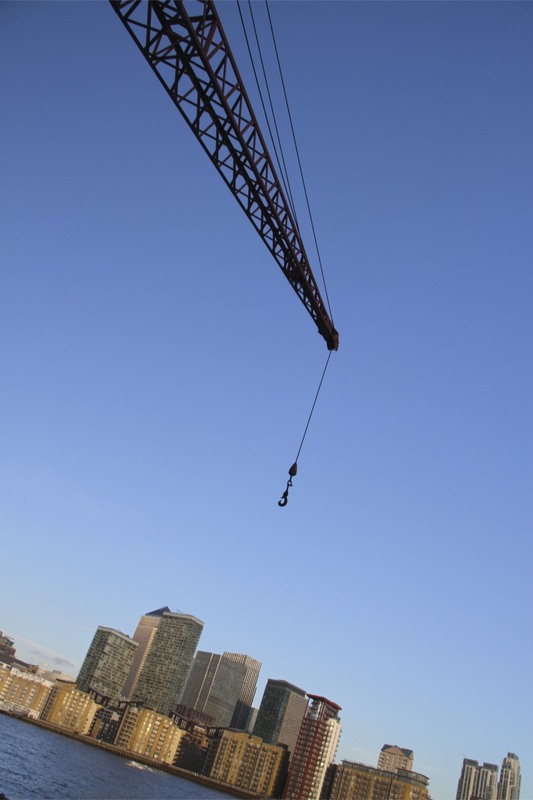 One stated I was stood on the site where the Great Eastern was built. The SS Great Eastern was the brainchild of legendary engineer Isambard Kingdom Brunel. When it launched in 1858 SS Great Eastern was by far the largest ship ever built, capable of sailing to Australia without refuelling. Sadly, the SS Great Eastern was a commercial failure, ending its days in ignominy as a floating advertisement for a department store. 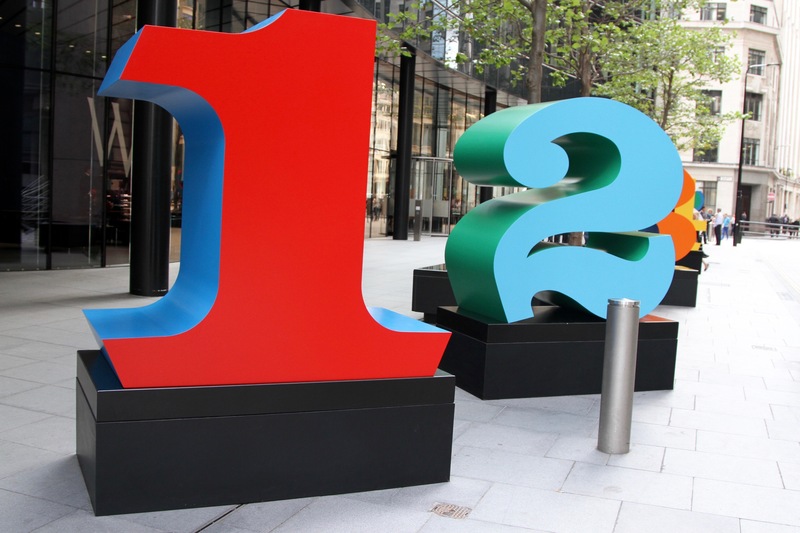 Leaving Canary Wharf behind, I arrived at the most exciting section of my walk. 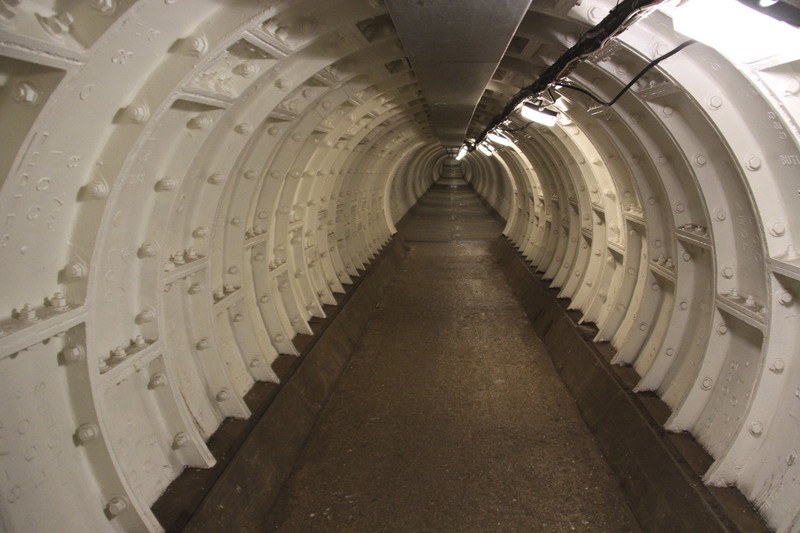 A small glass-topped dome marks the entrance to one of London’s hidden wonders: the Greenwich Foot Tunnel. 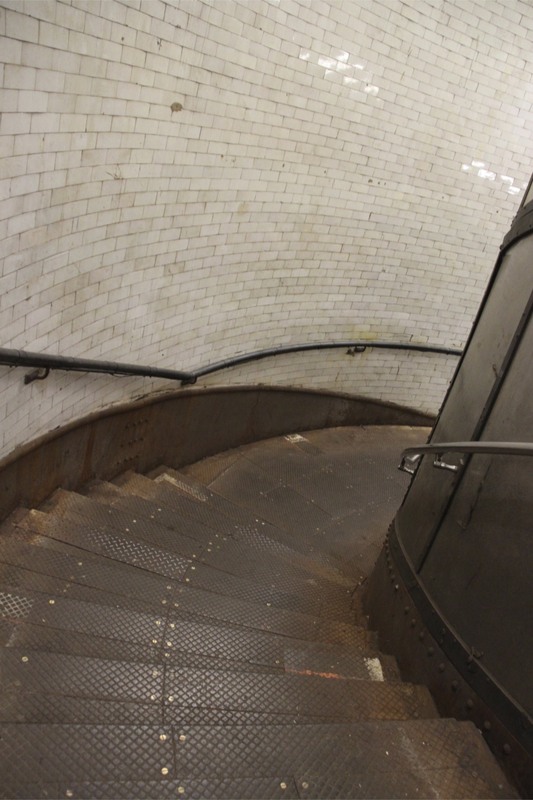 Descending the iron stairs, you walk the 370 metres through a tiled tunnel less than 3 metres in diameter underneath the River Thames. 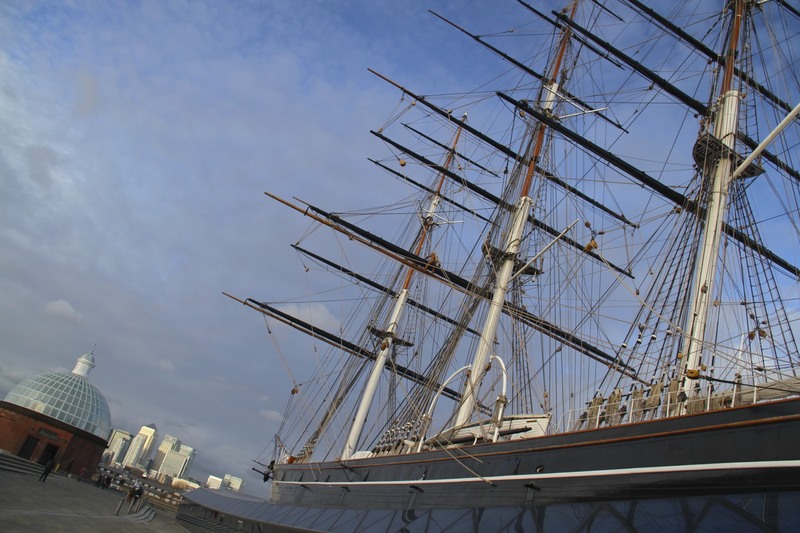 A few fun-filled minutes later you emerge next to the Cutty Sark in Greenwich. The northern end of the tunnel has a section of steel reinforcing it where it was damaged by bombs in 1940. It’s thrilling to walk through the tunnel. It has been used for all sorts of filming, events and ridiculous activities – bizarrely, it forms part National Cycle Route 1 (from Inverness in Scotland to Dover on the English Channel). More ridiculous, a marathon was run in the tunnel to mark it’s centenary. 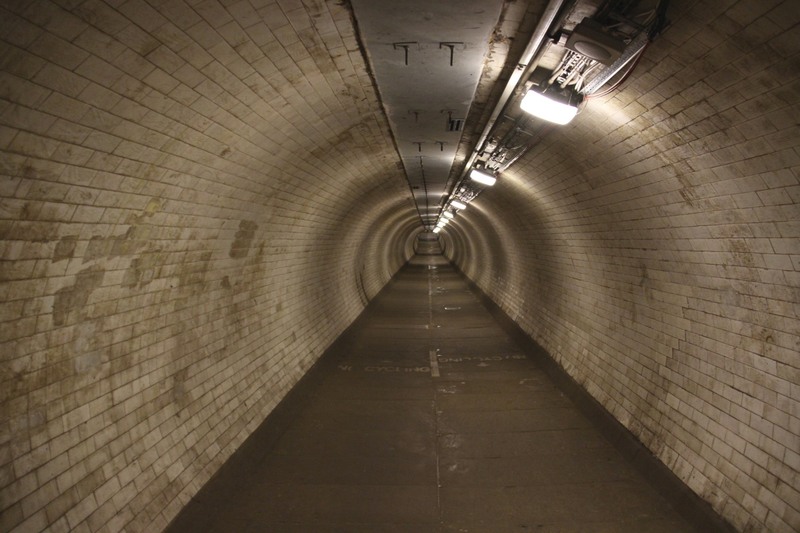 It takes 58 laps to run a full marathon in the tunnel, and there’s not much scenery en route. One hundred runners took part, and British marathon legend, Hugh Jones, won the race in a very credible 2 hours 45 minutes. 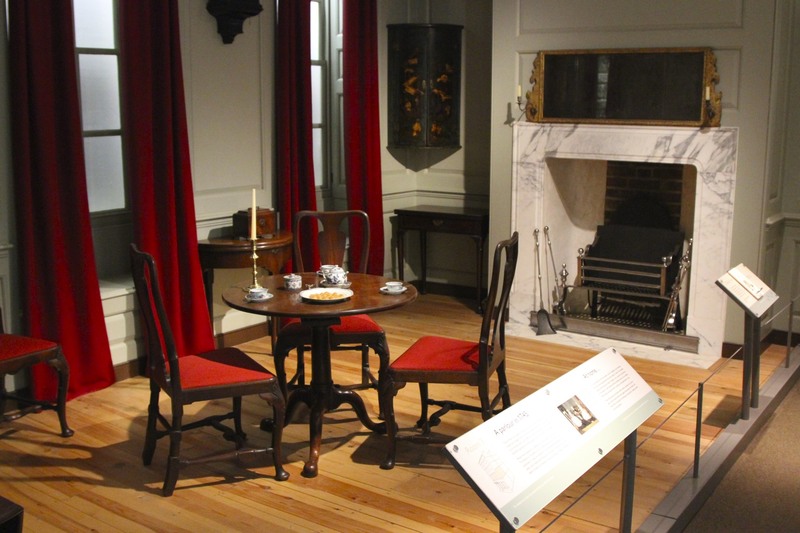 It may not sound like the most promising concept, but social history as told through the evolving interiors of people’s homes is much, much more fascinating than it may at first appear. 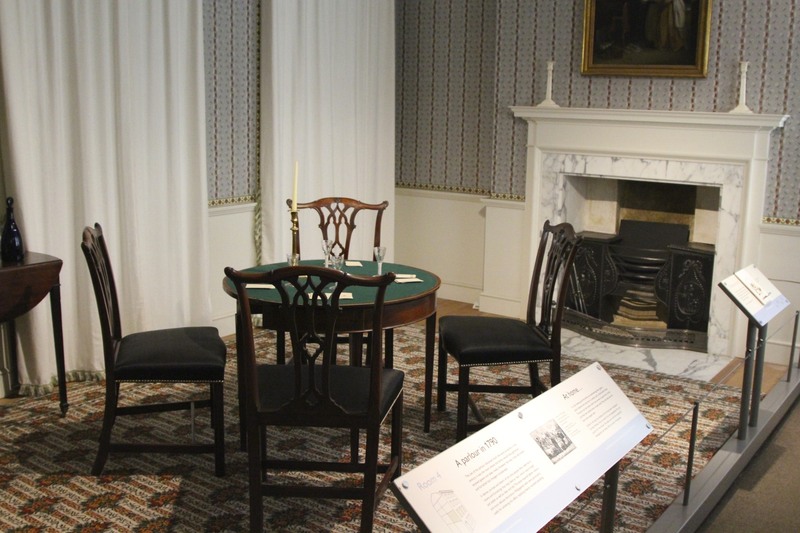 The excellent Geffrye Museum is first and foremost a history of the English middle classes. The evolution of the parlour, or living room, mirroring revolutionary changes taking place in society. This is best reflected in the impact of the Industrial Revolution on the home and the shifting roles of the sexes this caused. 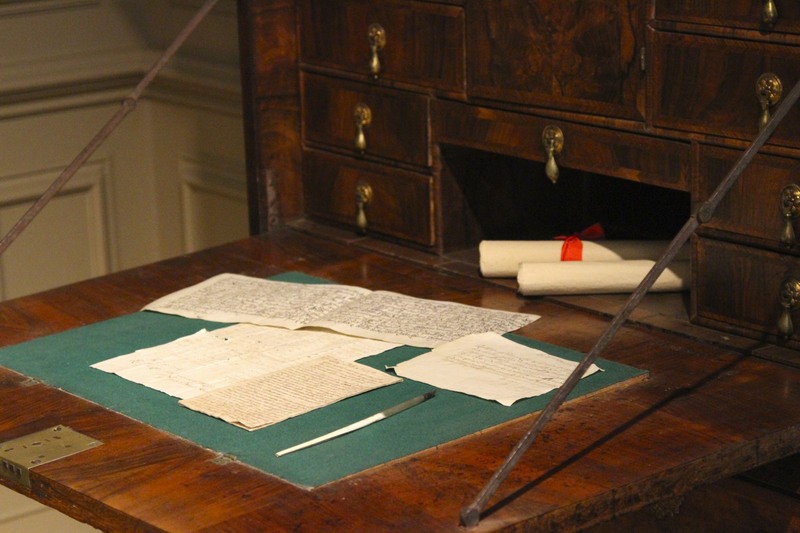 In a form of reverse snobbery, a museum dedicated to the middle classes is anathema to some. 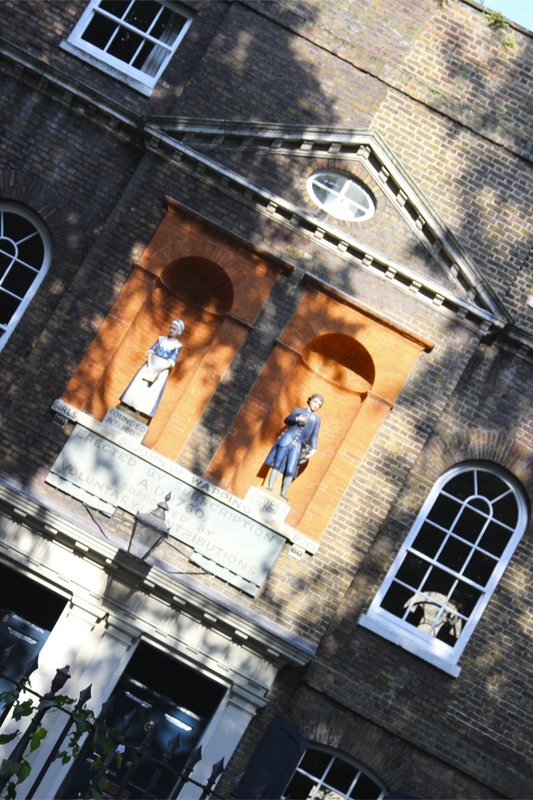 You could take the view that the Geffrye Museum is just about nice furnishings, and the evolving tastes of different generations. All very light-hearted and insignificant when set against the class struggle. In reality, it charts radical changes within society by opening a window into the intimate lives of our ancestors. I, for one, won’t look at people’s soft furnishings in the same light ever again. It shouldn’t be, but one of the surprises of the Geffrye Museum is realising that our obsession with owning ‘stuff’ is very modern. 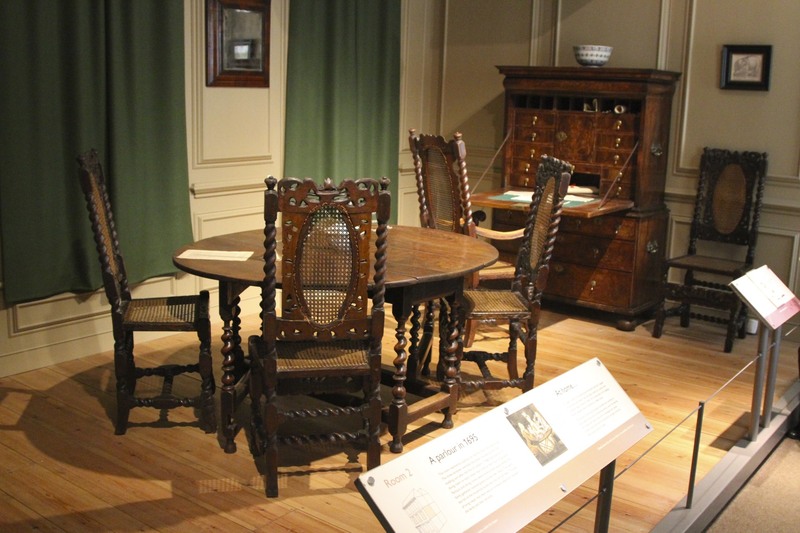 A walk through the 400 years of history on display is to be confronted with the fact that, until very recently, our living spaces had very few things in them. 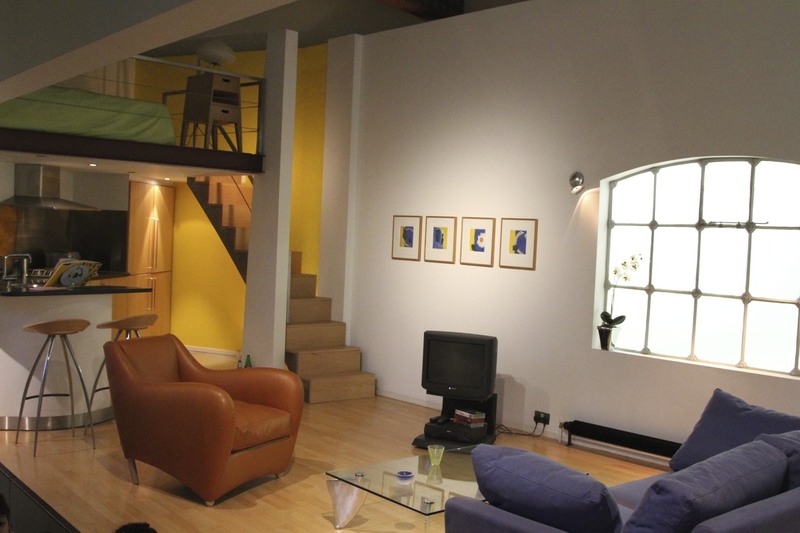 People were the focus of most living rooms, the space designed around human interaction. 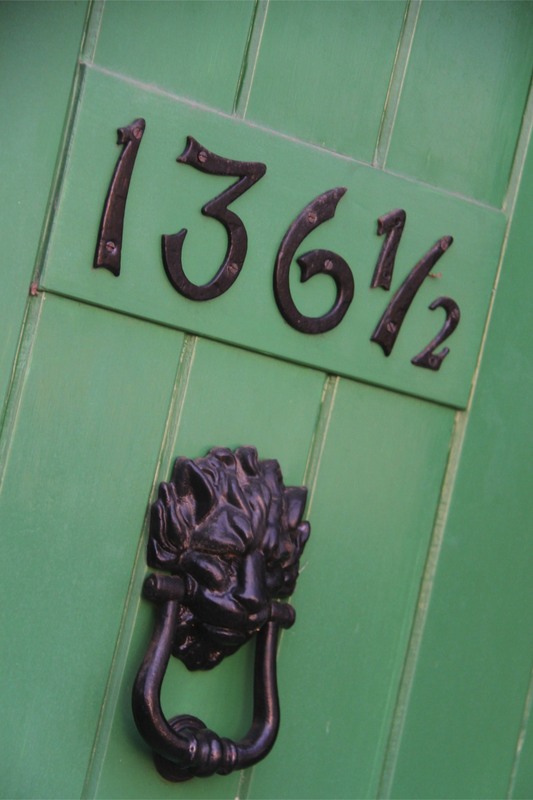 The difference between a home in 1790 and a home in 1890 is stark. 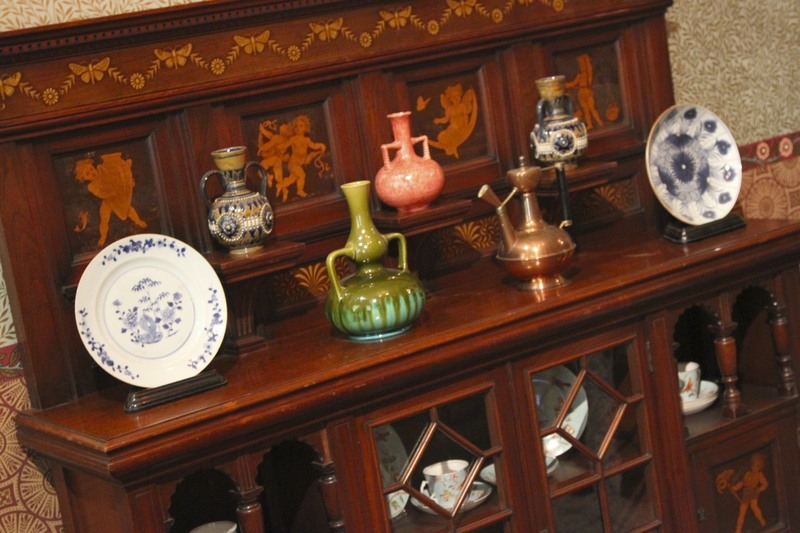 The 1890’s home is full of ornaments, paintings and furniture – cheaply produced on an industrial scale, and affordable for the middle classes. 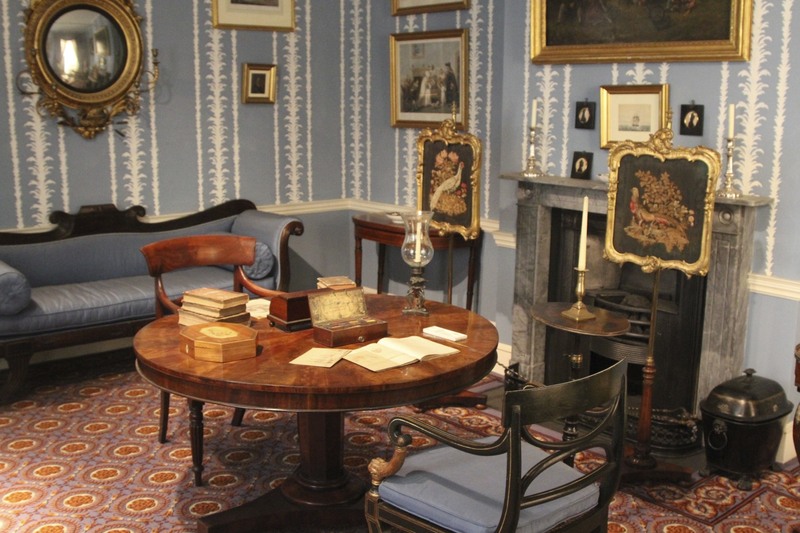 The average middle class home in the 1790s had only just been introduced to the concept of the carpet. 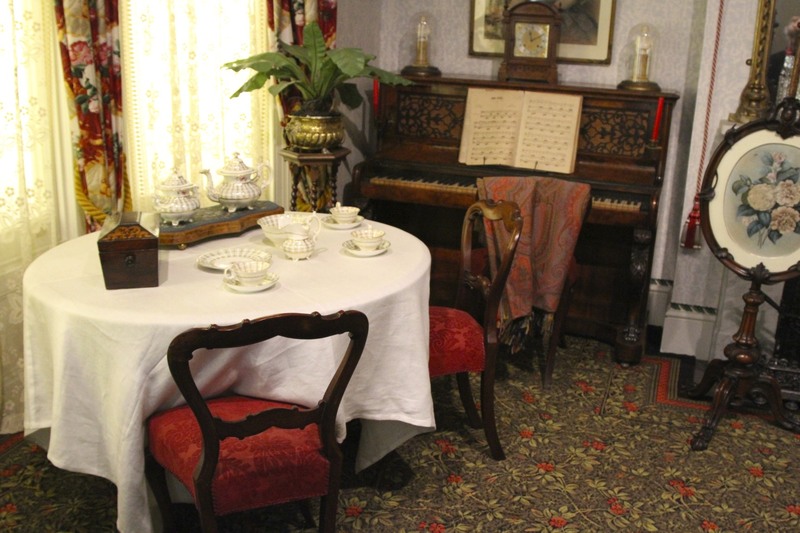 The 1890s parlour has more in common with contemporary homes than its historical predecessors. The technology has changed – the TV replacing the pianola – but we are still cramming our homes full of stuff. The Industrial Revolution saw a massive expansion in the number of people able to call themselves middle class, and allowed them to ape the tastes and styles of the aristocracy. In a class obsessed society like Britain, this was groundbreaking. The Industrial Revolution also changed the relationship both men and women had towards their home. 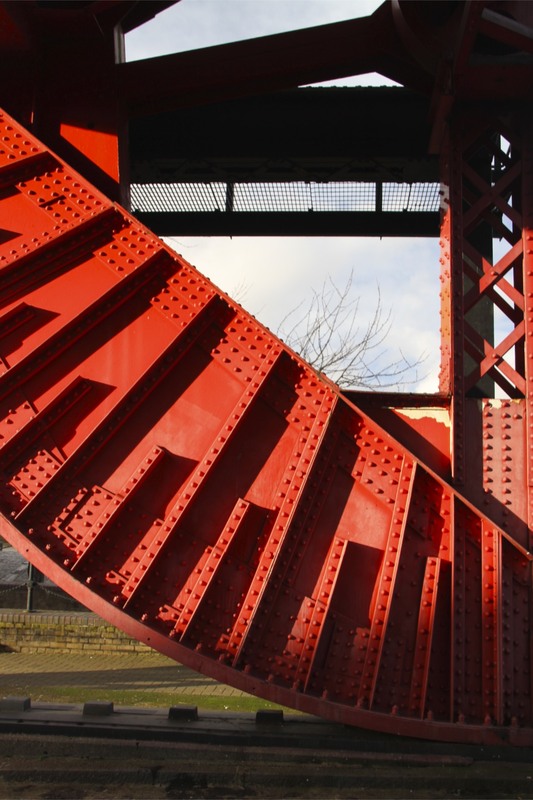 The world of work had changed dramatically by the mid-1800s. Men increasingly left the home in the morning and returned in the evening. It was from this period that the home becomes synonymous with femininity, with women left to ‘manage’ the home while their husbands went to work. The middle class home had been a workplace – merchant houses – and men and women spent the day there. The social revolution that came with new working patterns changed society’s view of the ‘ideal of womanhood’. Something women continue to deal with 150 years later. Middle class women were thrust into the role of home makers, judged only on their domestic accomplishments (singing, piano playing). This bred a whole new genre of literature on household management and domestic economy. Leading the charge, in 1859, was Mrs. Beeton’s Book on Household Management. 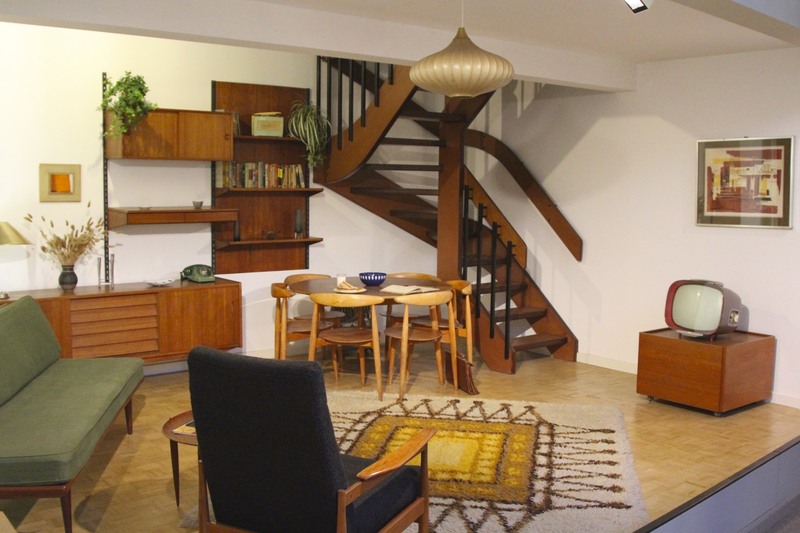 One of the Geffrye’s most fascinating tableaux is when you arrive at the interior of a 1950s house. The whole room is oriented towards the television. For the first time in four hundred years of domestic life, people in a room turned away from the other people in the room to face a box. A radical change in human behaviour. This trend has intensified as technology has advanced; computers, gaming consoles and multiple TVs have led to a further fracturing of human intimacy within the home. Of the 1990s loft conversion, with its merged kitchen/living/sleeping space, the least said the better. 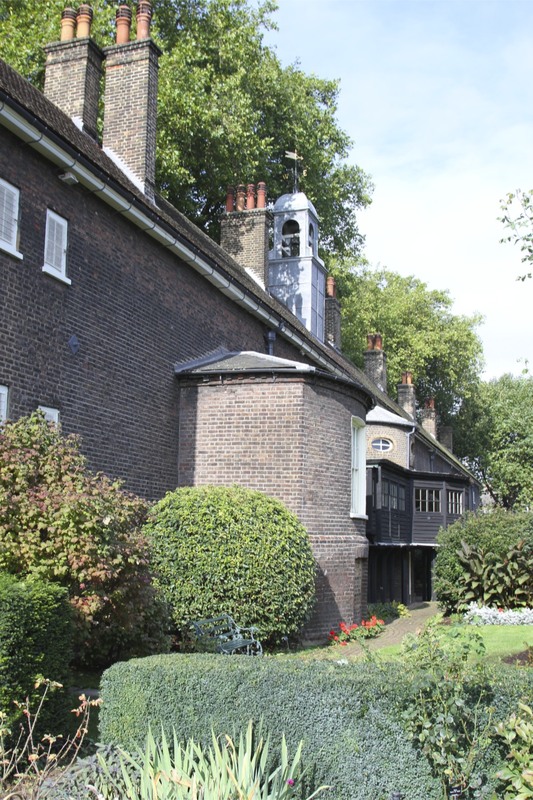 One of the joys of visiting the Geffrye Museum is that it is housed in some beautiful early-18th Century Almshouses. 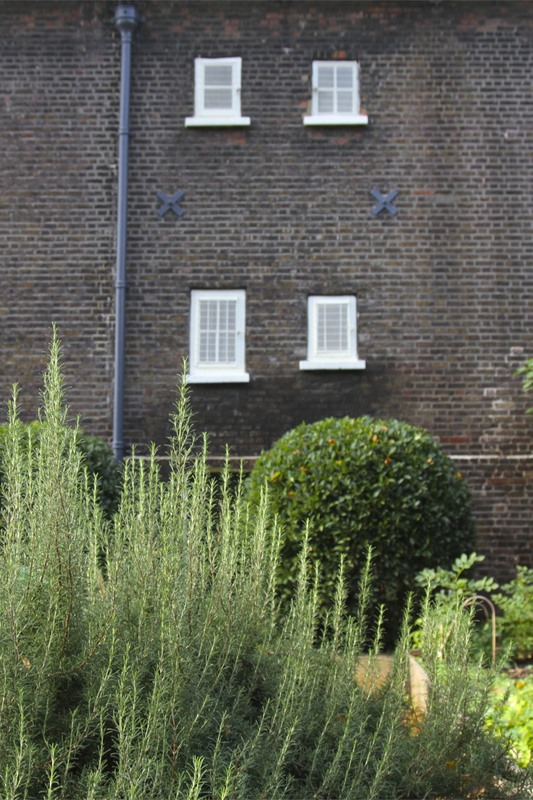 Constructed by the Ironmonger’s Company at the request of Sir Robert Geffrye, Mayor of London and Master of the Ironmonger’s Company, they are a rare example of architecture from this period in East London. 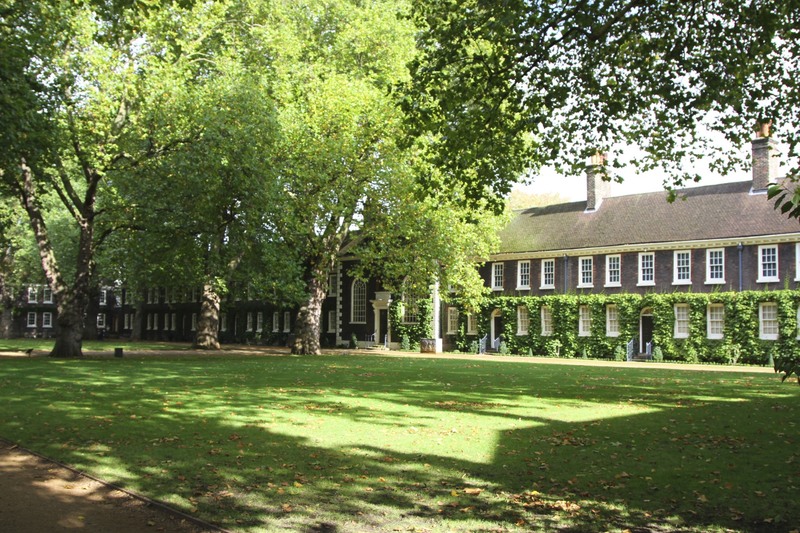 The grounds of the museum are lovely, with people having their lunch in front of the building and period gardens at the rear. 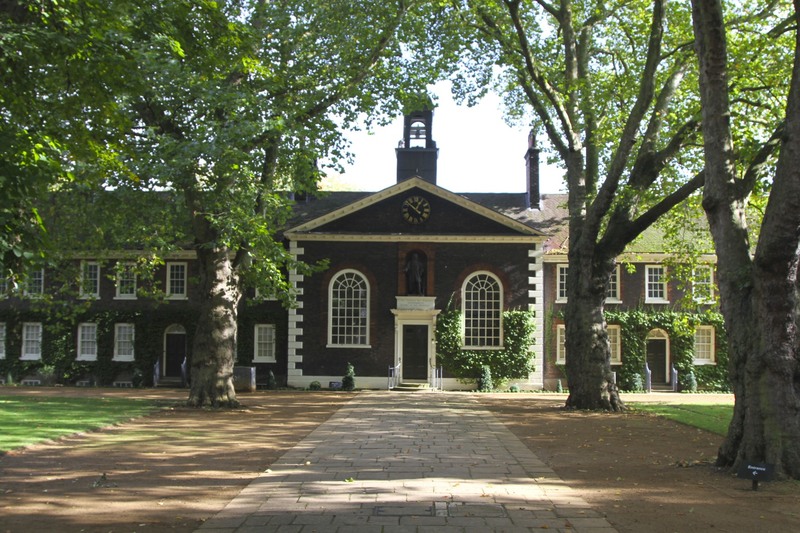 Perhaps best of all, the Geffrye Museum is free – there is a small charge to visit a restored almshouse, but this is only occasionally open. Prior to the Roman Occupation, the British and Irish Isles were populated by Celtic tribes. The Roman Empire never made it to Ireland and they eventually settled on Hadrian’s Wall for containment and trade, instead of conquest and occupation, in Scotland. England’s Celtic population was absorbed into the Roman Empire, and successive waves of migration from Continental Europe saw much of its culture disappear. Celtic history continues to live on through language (not to mention the gene pool). 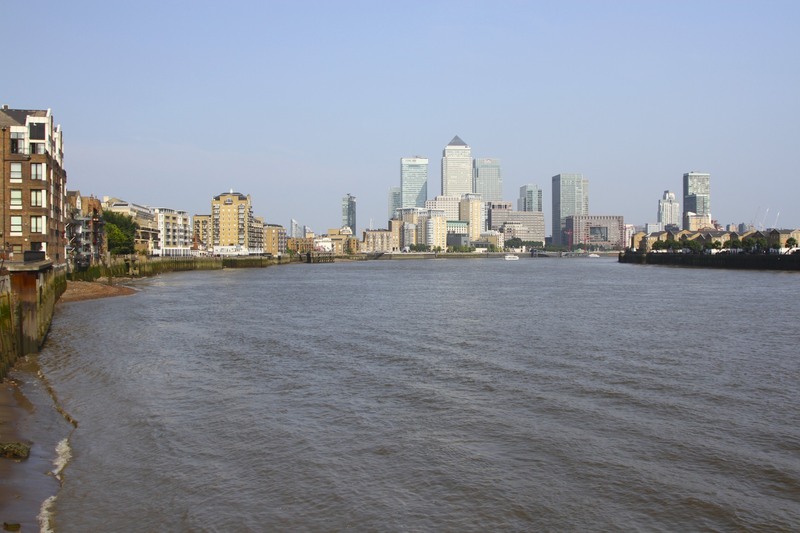 The River Thames derives its name from the original Celtic: Tamesas, meaning ‘dark’. 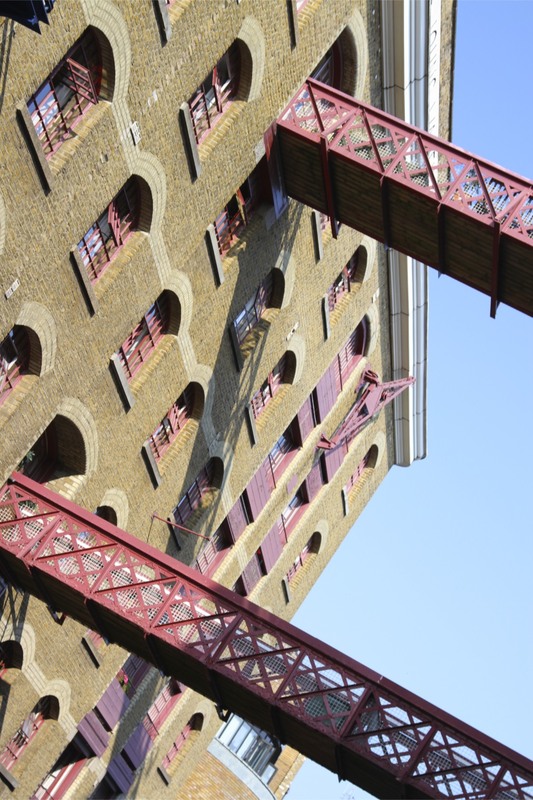 A walk from Limehouse Basin to Tower Bridge along the river through the Wapping district, is to walk through London’s history: a history built on the tides of the Thames. From Roman-times, this area has been central to England’s (and later Britain’s) maritime trade. 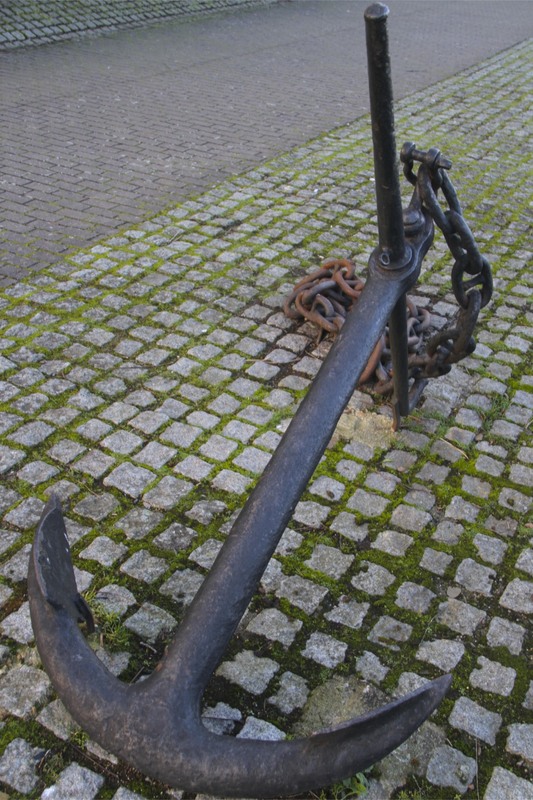 It became home to all the trades that kept the merchant fleet afloat: sailers, sail makers and maritime instrument makers all congregated here. 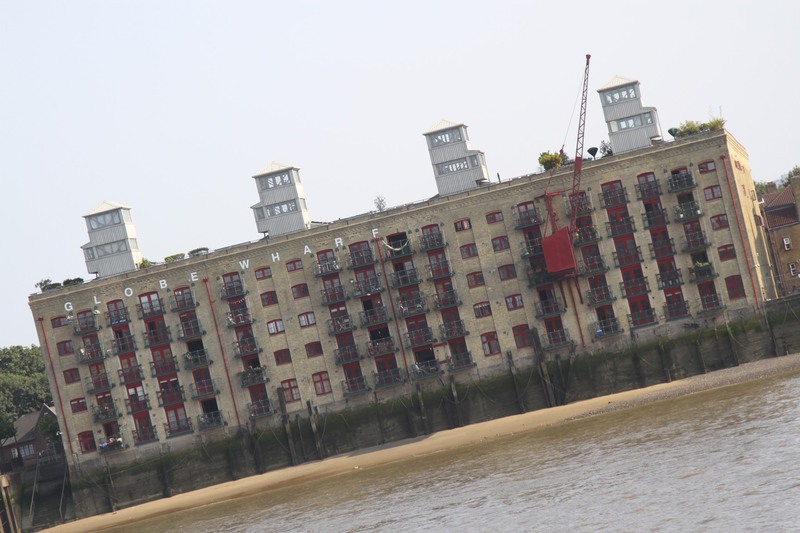 Huge warehouses containing goods of all descriptions lined the banks of the Thames. 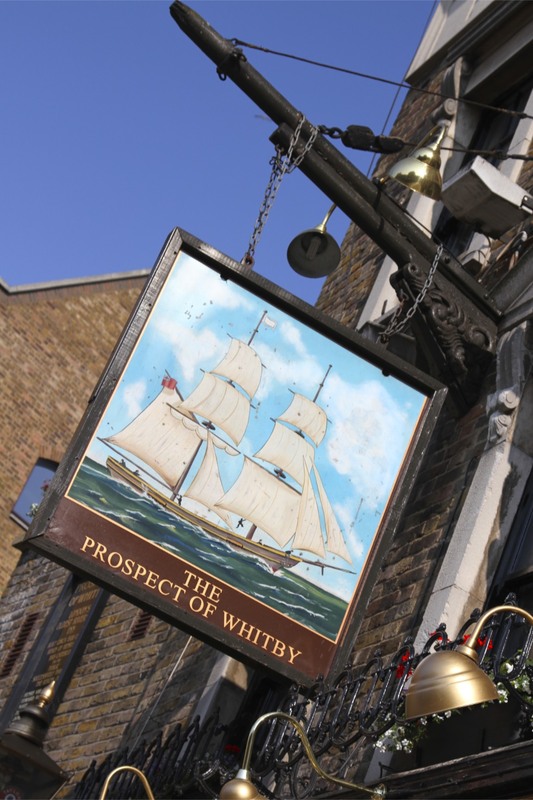 Pubs, gambling dens and brothels proliferated, and the area had a very unsavoury reputation – the Prospect of Whitby, a pub overlooking the river, was once known as the Devil’s Tavern because of its violent reputation. The area attracted thieves, smugglers, pirates and lowlifes of all sorts. 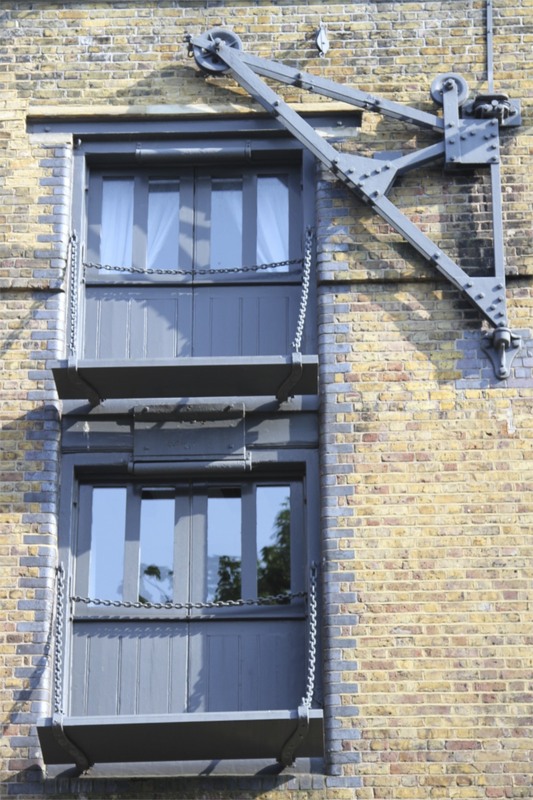 Its not surprising that there was a ‘hanging dock’ over the river, where criminals would receive “a short drop and a sudden stop”. 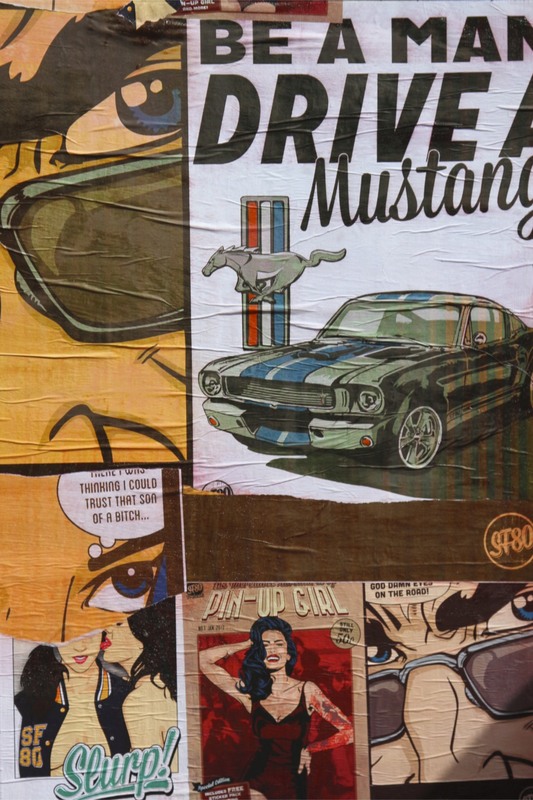 Here, amidst the chaos of narrow, crowded and frequently dangerous streets, travellers and exotic goods from around the world would arrive into one of the world’s truly international cities. Passengers and cargo alike, would be disgorged into the teeming streets and congested alleyways that formed Wapping. 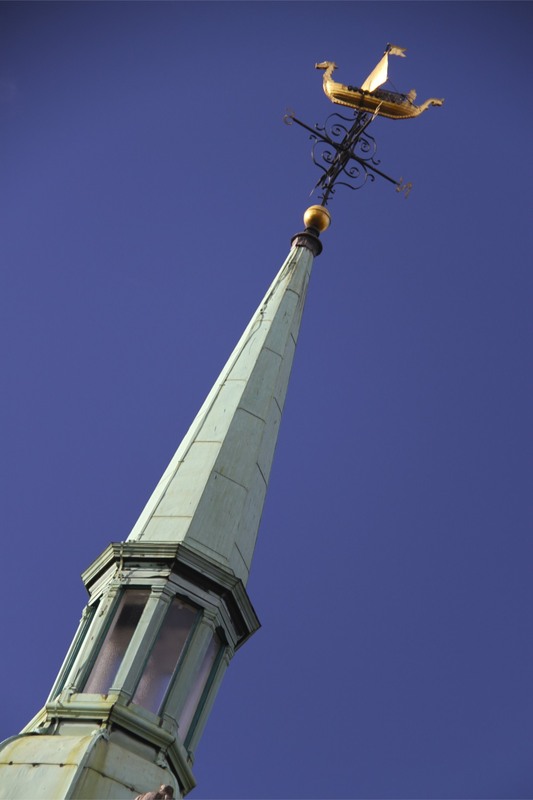 As if to offset this seedy world, the area also has plenty of churches – and there were numerous nineteenth century Christian Missions active in this area. One of the most famous churches is St. John the Baptist. 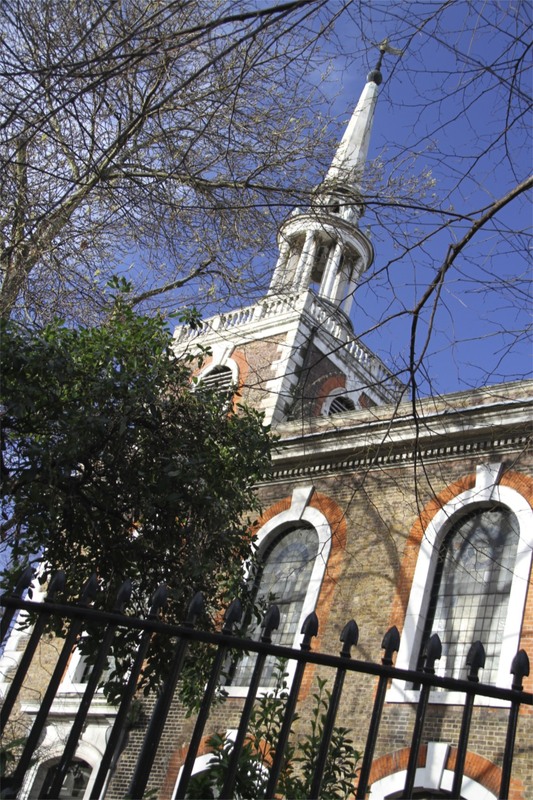 Constructed in 1617, it was demolished in the 1750s to make way for a new church. 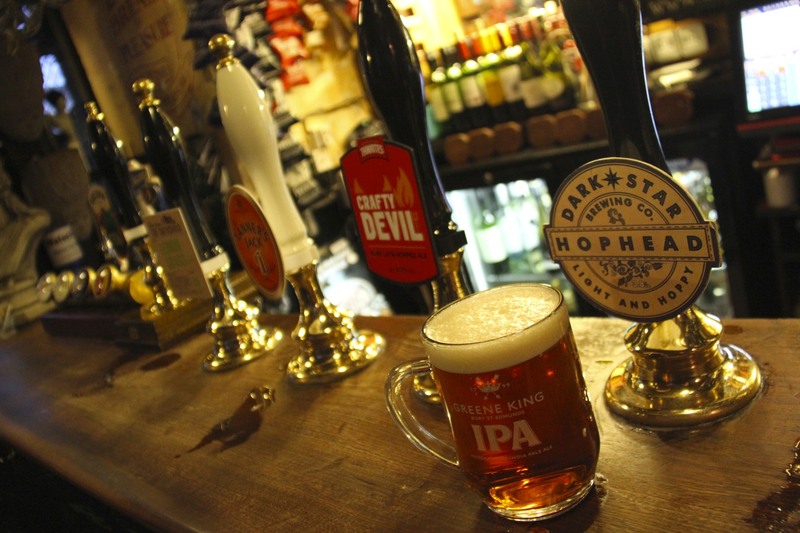 It stands, incongruously, next to the Turk’s Head pub: as so often, virtue and vice go hand-in-hand. 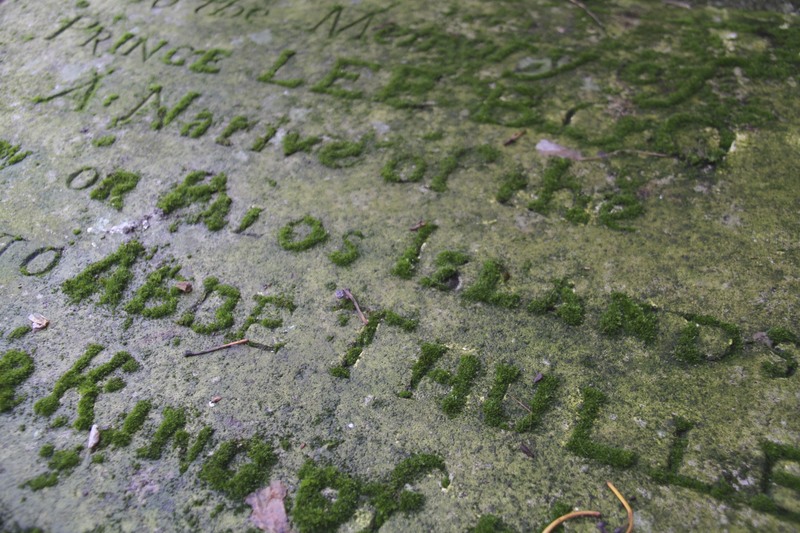 The cemetery is the burial place of Thomas Rainsborough, a colonel in Oliver Cromwell’s New Model Army during the English Civil War. Rainsborough was a leader of the Leveller movement, and their spokesman at the Putney Debates. 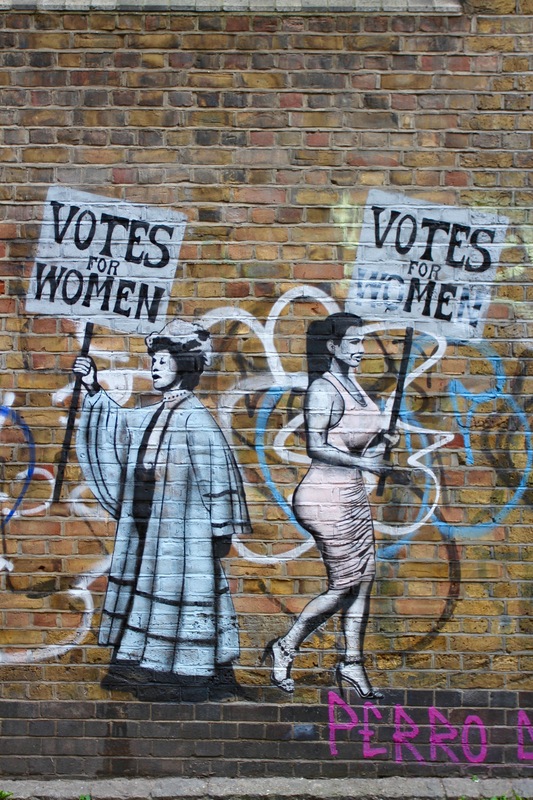 During the debates, Rainsborough argued for universal suffrage for all men, regardless of their wealth or status. It was a radical position in 1647, and one that brought him into conflict with Cromwell. 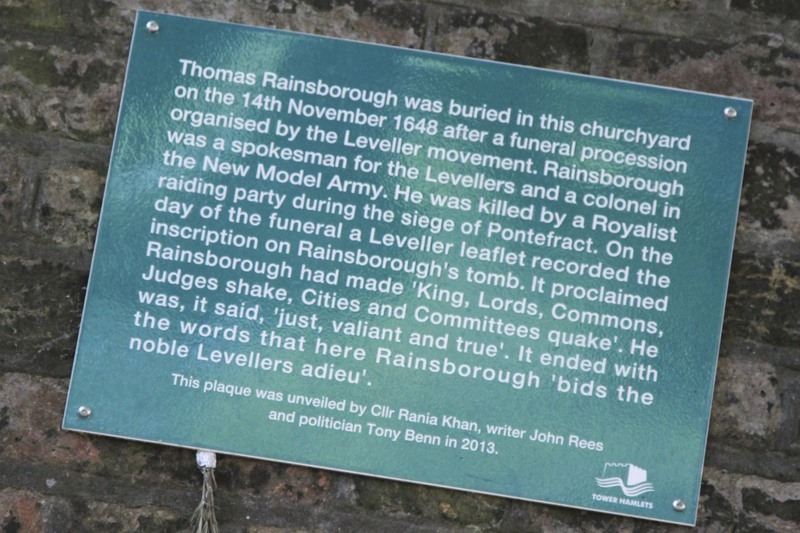 Rainsborough was buried in 1648 following a procession of thousands of Levellers through the Wapping area. 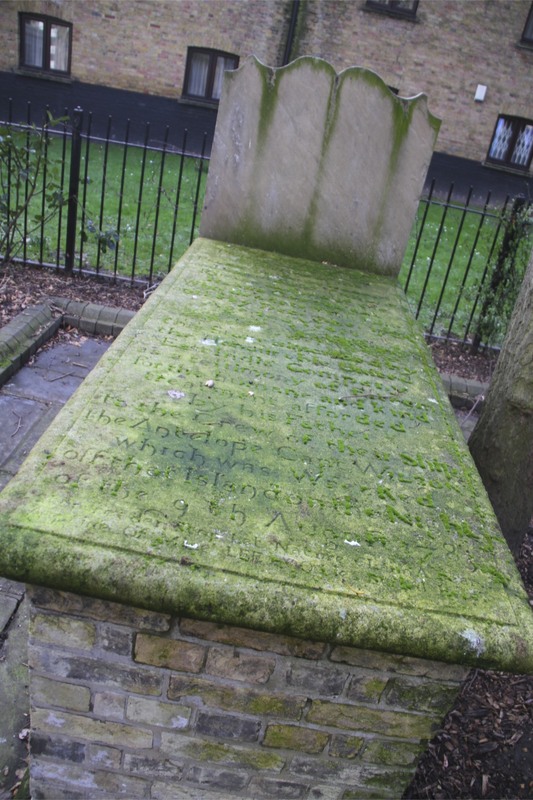 His tomb contained an inscription declaring that Rainsborough had made, “Kings, Lords, Commons, Judges shake, Cities and Committees quake”. The latter presumably a reference to the Putney Debates. 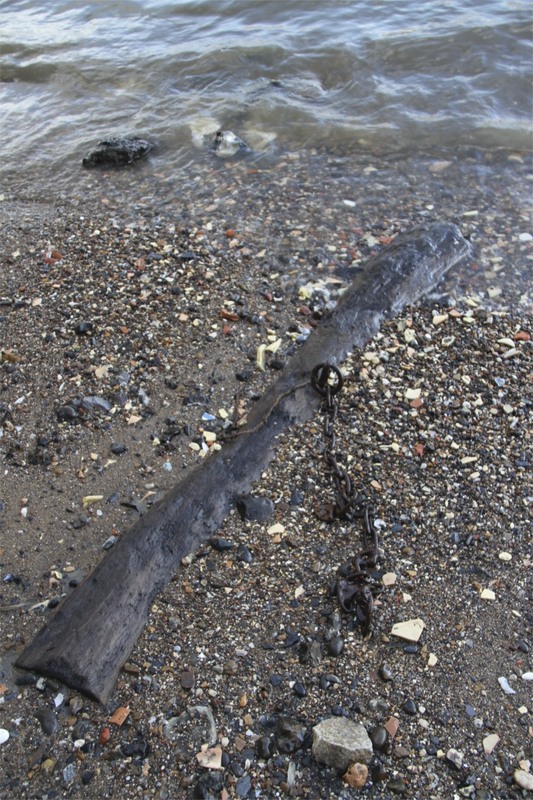 This part of the Thames was an economic thread to the rest of the world. 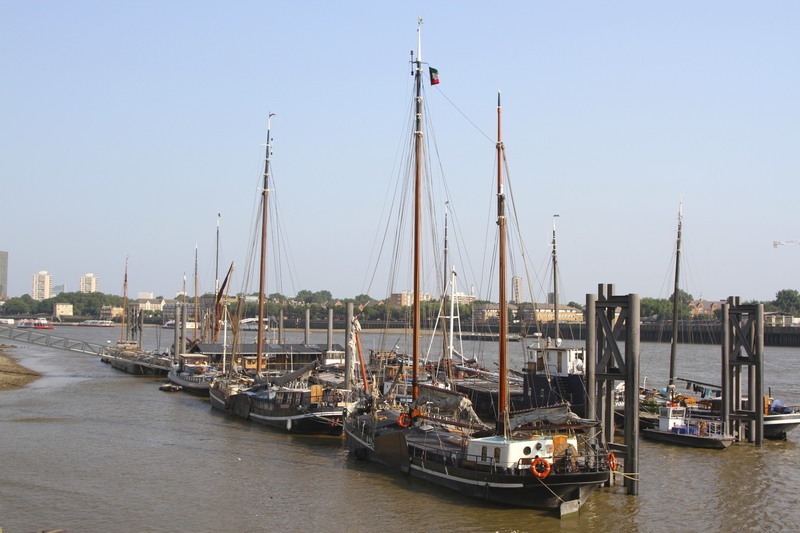 From the sixteenth century onwards the river teemed with boats of all shapes and sizes. Traditionally, ships docked at wharves constructed on the river. 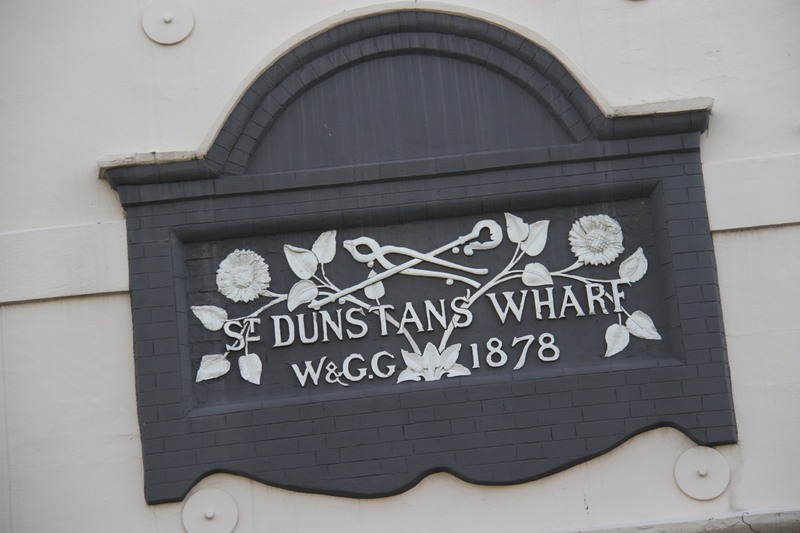 However, the expansion of Empire, and the huge growth in global trade, led to the construction of London Docks and St. Catherine’s Dock in the first half of the nineteenth century. Most of the old wharves are now apartments. In the late nineteenth century the area shed its notorious reputation for poverty and crime. Yet, in the early twentieth century the area was economically depressed. Things got worse with the world-wide depression of the 1930s. This was the working class East End, home to significant immigrant communities, including a large Jewish community. In the 1930s, the scene was set for ugly confrontations between Oswald Mosley’s pro-Hitler, proto-fascist ‘Blackshirts’, and anti-fascist groups. 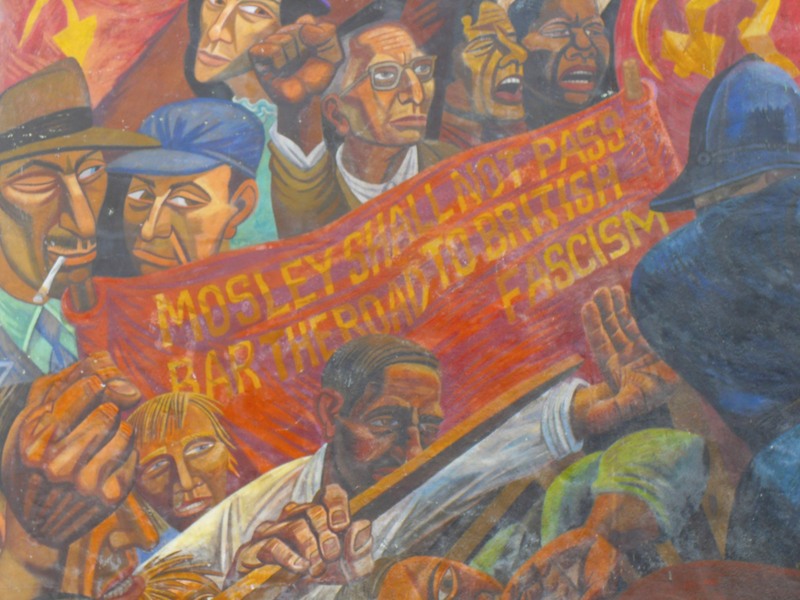 This struggle culminated on 4th October, 1936 when Jewish, Socialist and Communist groups joined with Trade Unionists and Irish dockers to block a march by Mosley’s British Union of Fascists through the East End. 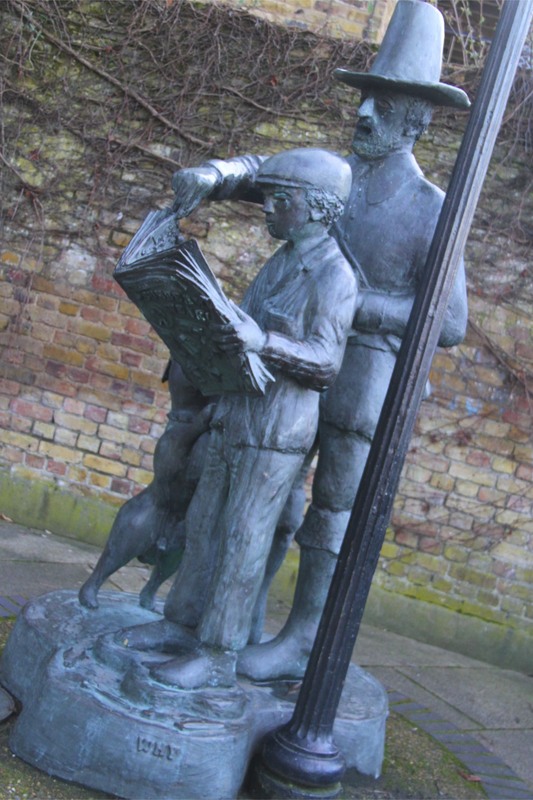 The ensuing bloody confrontation became known as the Battle of Cable Street. 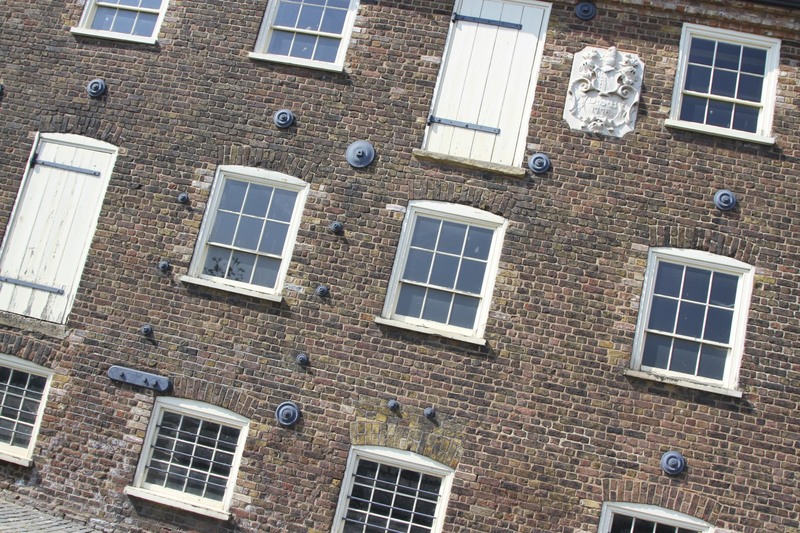 The Second World War brought wholesale destruction to Wapping from German bombing. In 1945, Wapping was devastated. 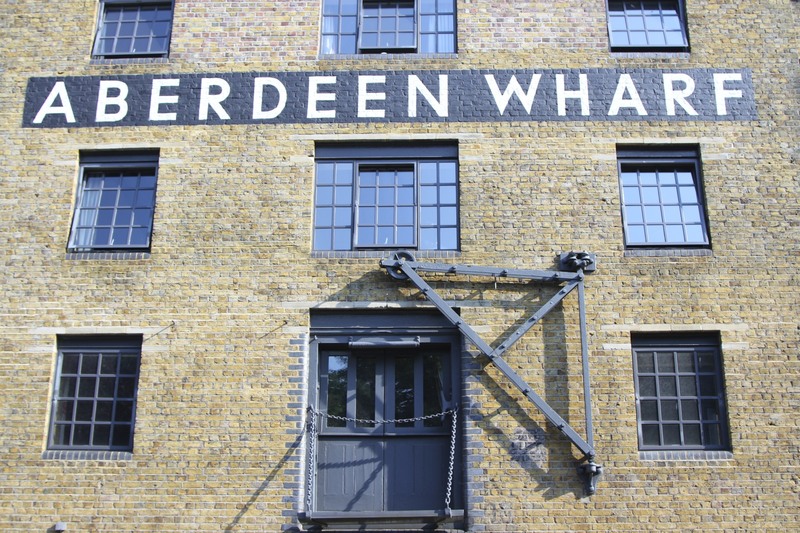 It remained run-down and derelict until the 1980s, when, not coincidentally, two things happened: Margret Thatcher’s government set up a Development Corporation to regenerate the area; and Rupert Murdoch moved News International (owner of four British newspapers) to a new headquarters in Wapping. Murdoch’s move was designed to crush the power of the printing unions. As if mimicking the conflict of the 1930s, fierce battles were waged in the streets of Wapping between strikers and police. After a year of strikes and dispute the unions lost. 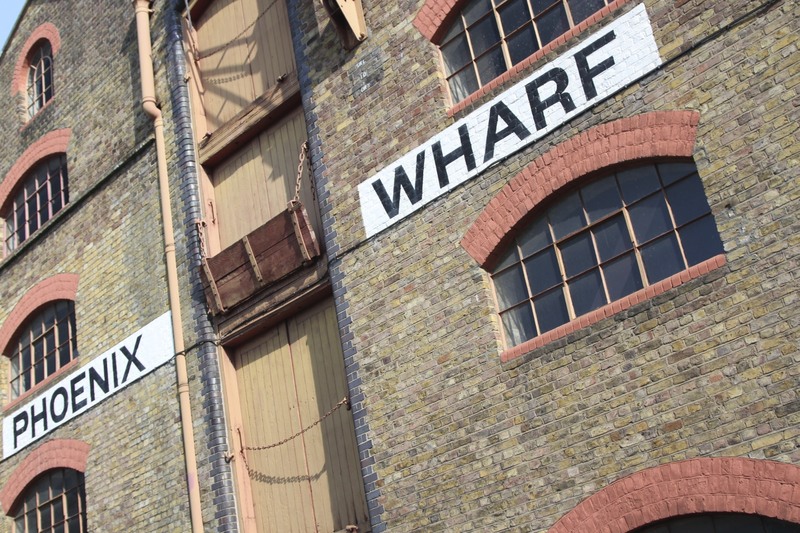 Today Wapping is a Thatcherite dream come true. 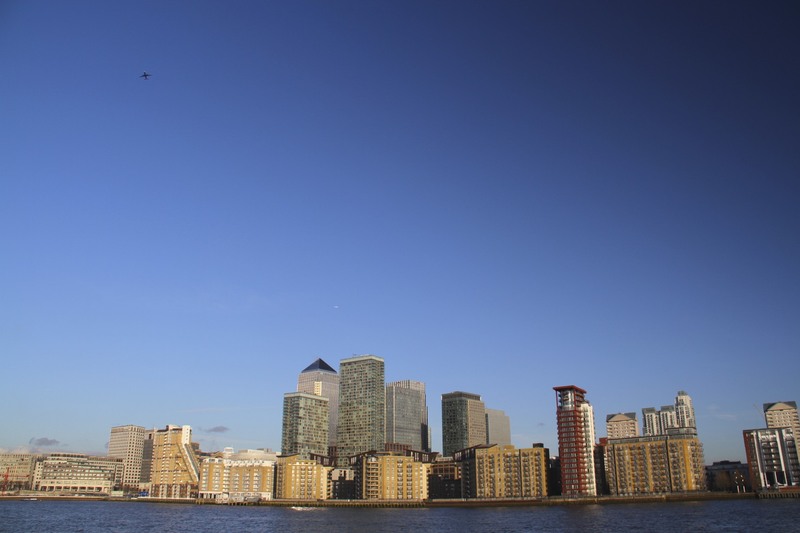 Within sight of Tower Bridge, regeneration had pumped money into the area: former warehouses to the Empire are now ‘luxury’ apartments occupied by bankers and finance executives; glitzy restaurants have mushroomed. You don’t have to look too far to find entrenched poverty amidst the new-found glamour, but that was never part of the Thatcherite narrative. 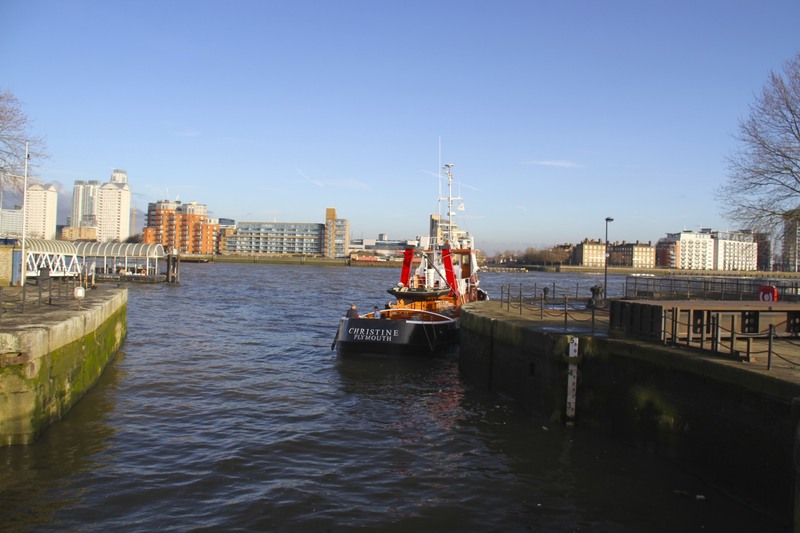 If there is one area of London that charts the city’s history, it must be this stretch of the River Thames…and that’s even before mentioning Tower Bridge. 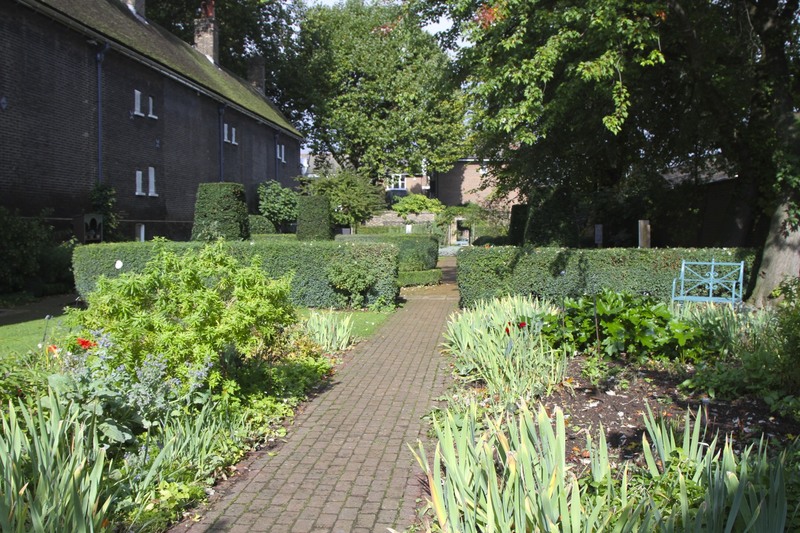 Think of London’s great green spaces and, chances are, the manicured central parks (St. James’, Green, Regent’s,) or the largest of the old royal hunting grounds in Richmond, will spring to mind. This sprawling city has far more to offer than just the royal parks though. Speak it quietly in these days after the royal birth, but in the east there’s a republic of green space, mandated by Parliament for the people. 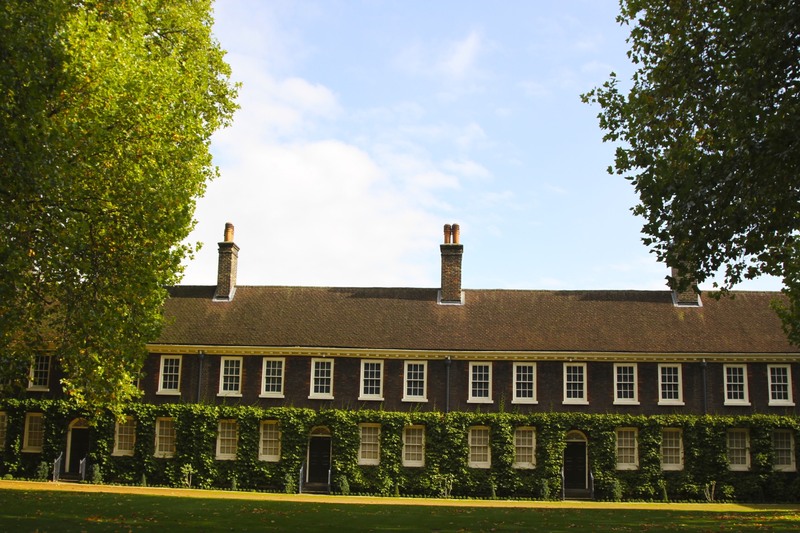 Head to the fringes of the Borough of Hackney and you’ll discover one of London’s ‘green lungs’, dwarfing all the ‘Royal Parks’. 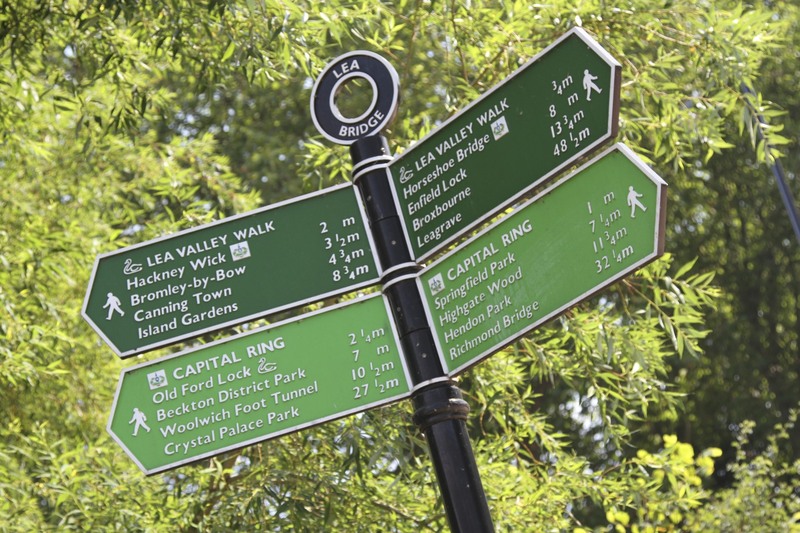 The less well known Lee Valley is a fabulous 26 mile long, 10,000 acre park; four times larger than Richmond Park and encompassing two historic waterways: the River Lee and the Lee Navigation. 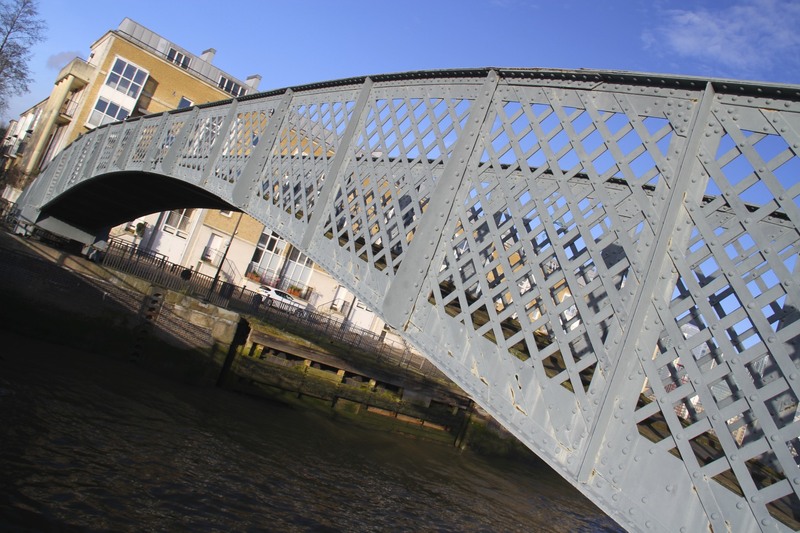 The former provided fresh drinking water to London, the latter a vital transport link connecting the River Thames, the Regent’s Canal, the Hertfordshire Canal and the Grand Union Canal. 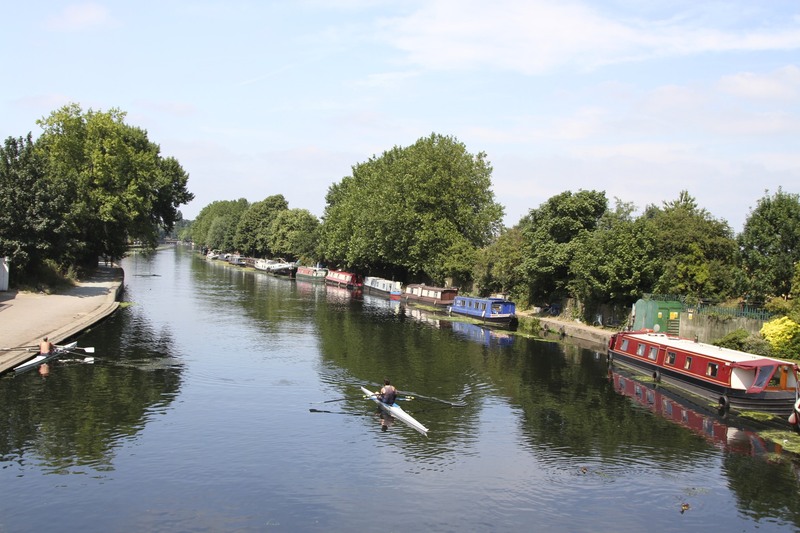 From Finsbury Park it is a short walk to reach Springfield Park and the Lee Navigation at the northern tip of Walthamstow Marshes. 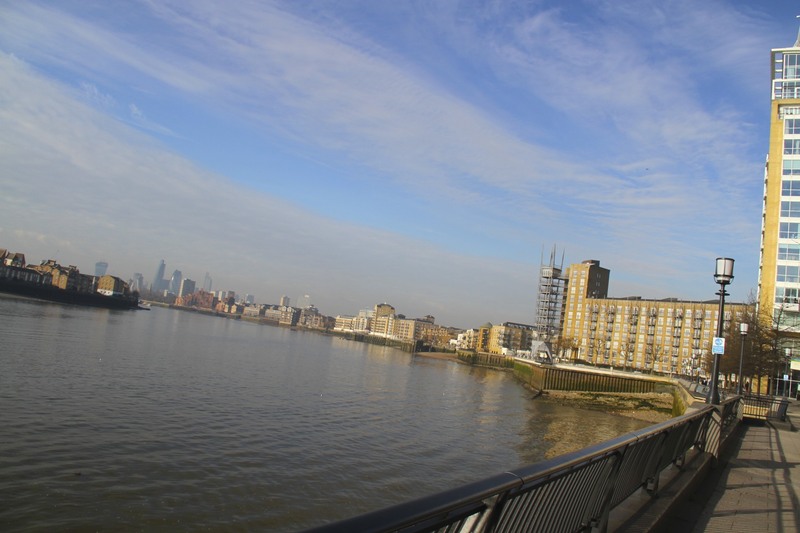 From here it’s possible to follow the course of the waterway south all the way to the River Thames at Limehouse Basin. 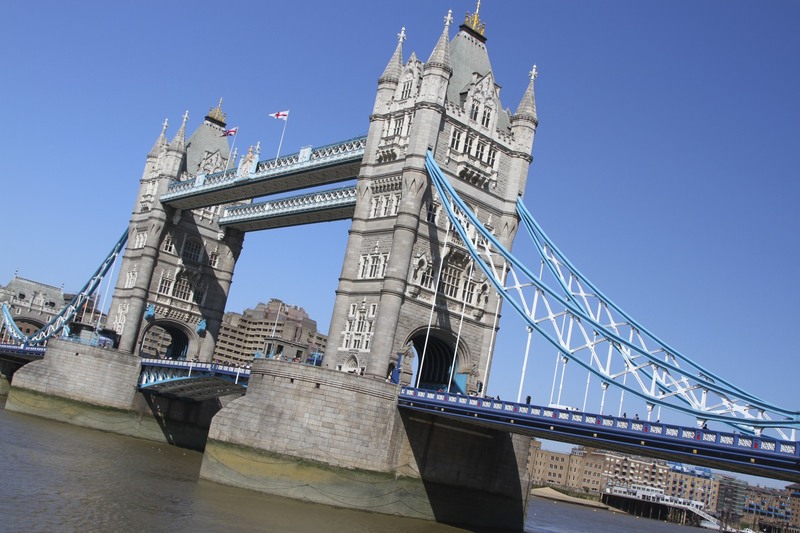 Another hour’s walk west brings you to Tower Bridge and the heart of the city. 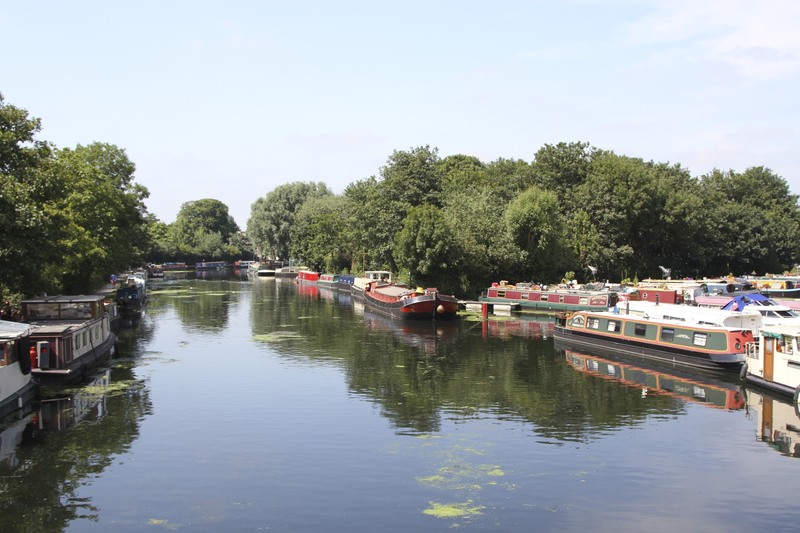 This network of waterways provides access to large parts of London, you could spend days exploring the city using only its historic waterways. 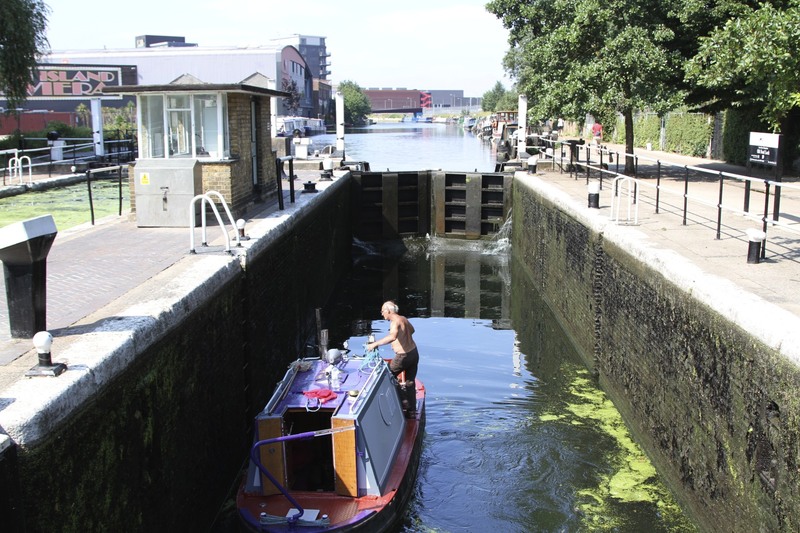 What is perhaps most surprising when you wander down these waterways today, is how many boats use them and just how many people are living on the canals of London. This is either a lifestyle issue or an indication that London’s housing crisis has reached breaking point. Either way, the canals are probably busier now than they have been since the start of the twentieth century. 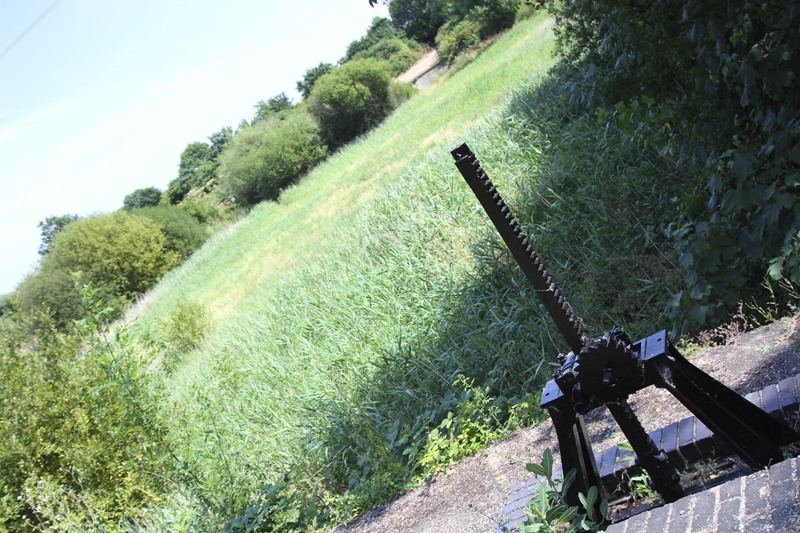 The Lee Valley comprises areas of urban green space, wildlife reserves, industrial heritage sites and riverside walks. 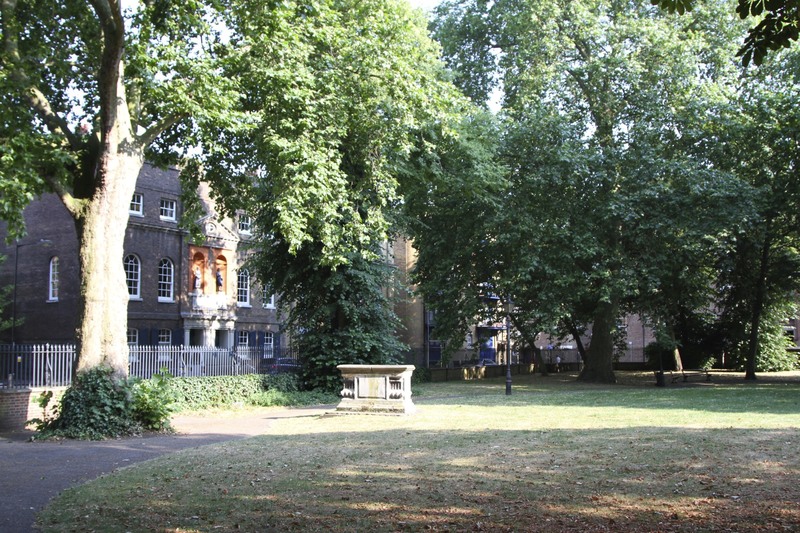 It is a lovely and, until recently, under-utilised green space, much of which was located in less-than-salubrious districts of London. 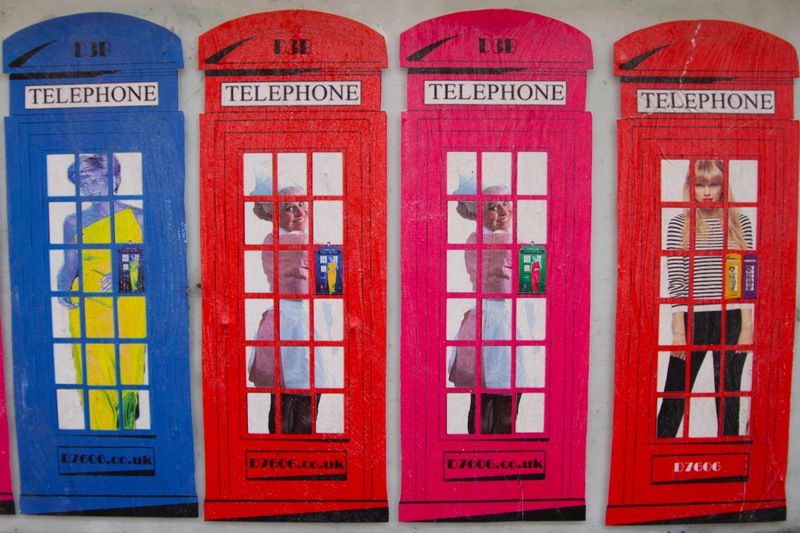 All that changed when London won the bid for the 2012 Olympics. 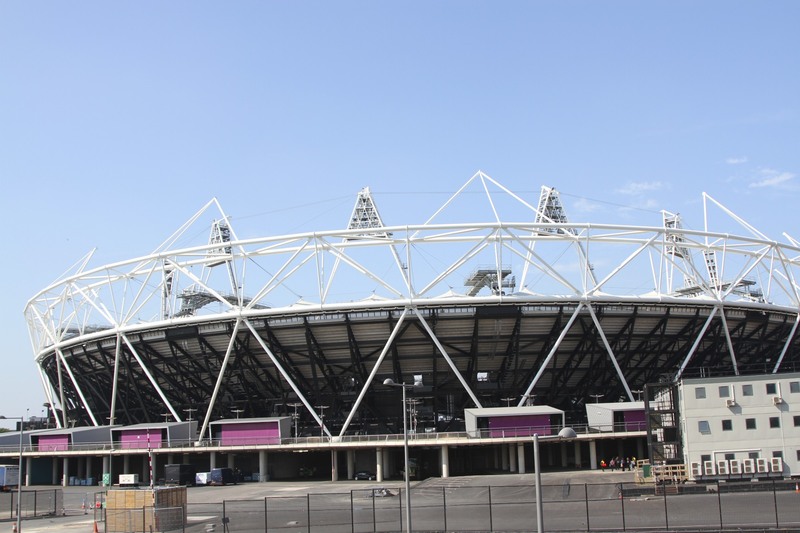 The sprawling Olympic site is located in the southern part of the Lee Valley, and has pumped much needed regeneration money into this neglected region. 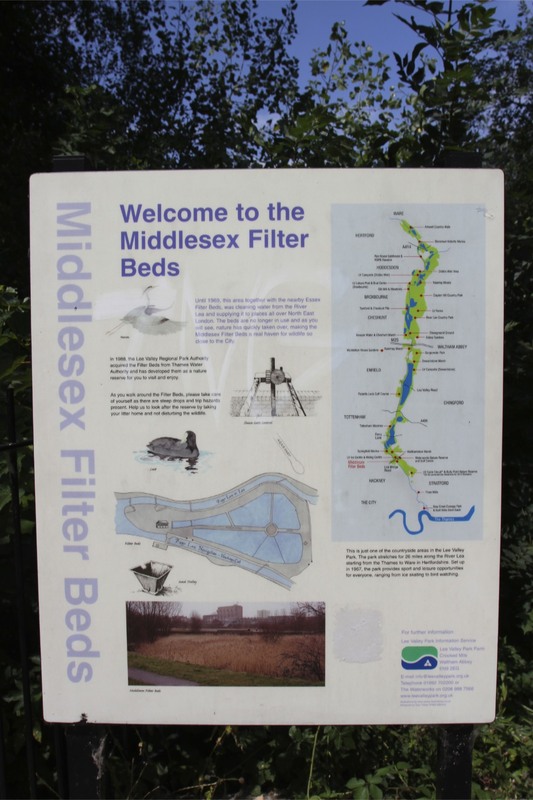 One area worth a visit is the old Middlesex filter beds. There’s not much to see today, but this amazing piece of technology purified water for London right up until the 1960s. 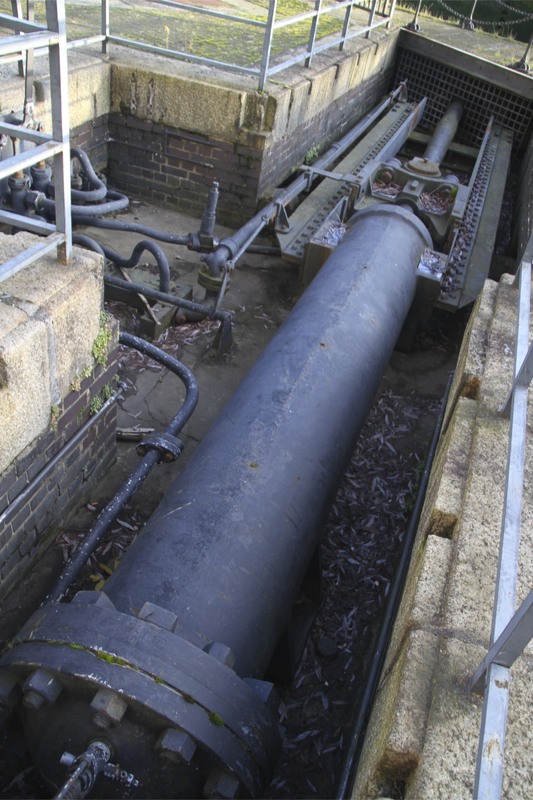 The water was taken from the River Lee further to the north (where it was cleaner) and stored in reservoirs, before being piped to the filter beds by aqueduct. Here it was filtered through sand and gravel, purifying the water by killing diseases like cholera. 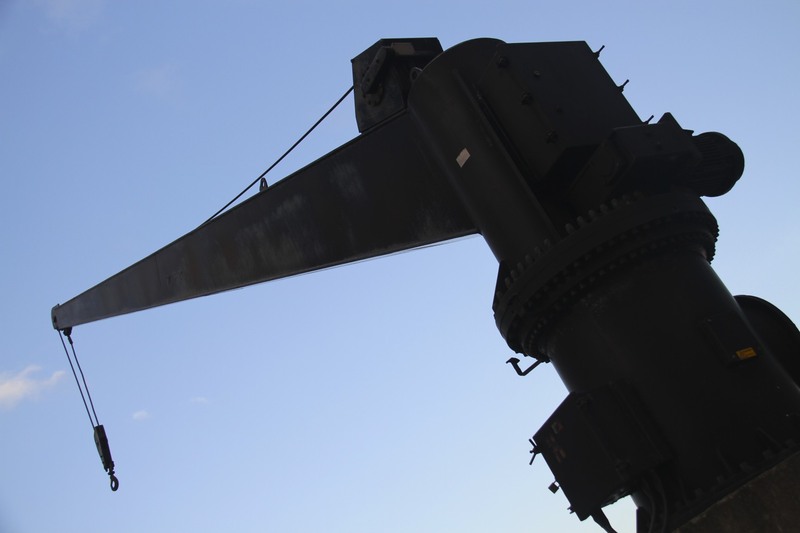 It was then pumped to supply homes in north-east London. Brilliantly simple. Today it is a nature reserve. 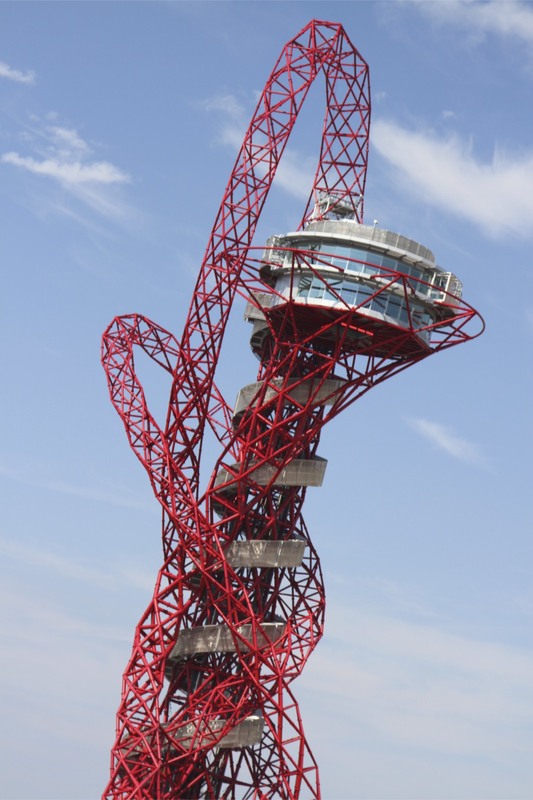 Following the Lee Navigation south takes you alongside the Olympic Park, and you can come off the river close to Victoria Park to get a better view of the stadium and the Orbit sculpture designed by Turner Prize winner, Anish Kapoor. They make for dramatic additions to the skyline. 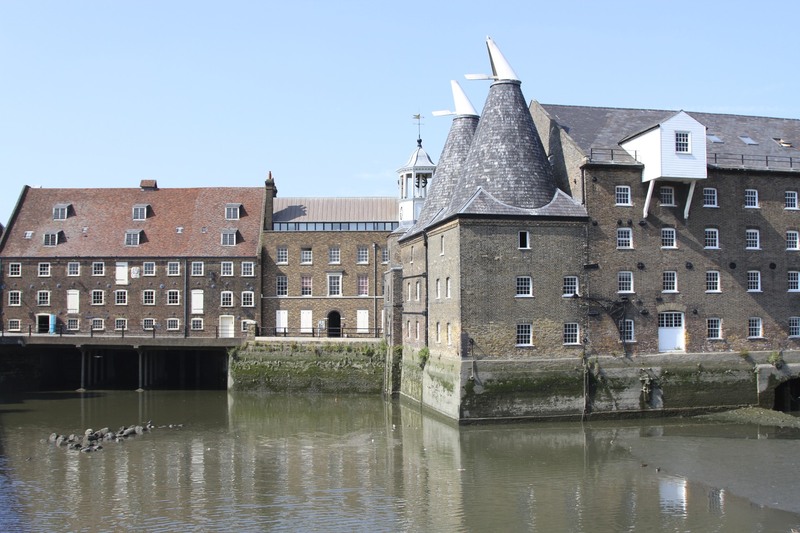 Further south, you’ll pass the lovely old building of Three Mills. This ancient industrial site was recorded in the Doomsday Book, and the mills are probably the oldest known ‘tidal mills’ in the world. 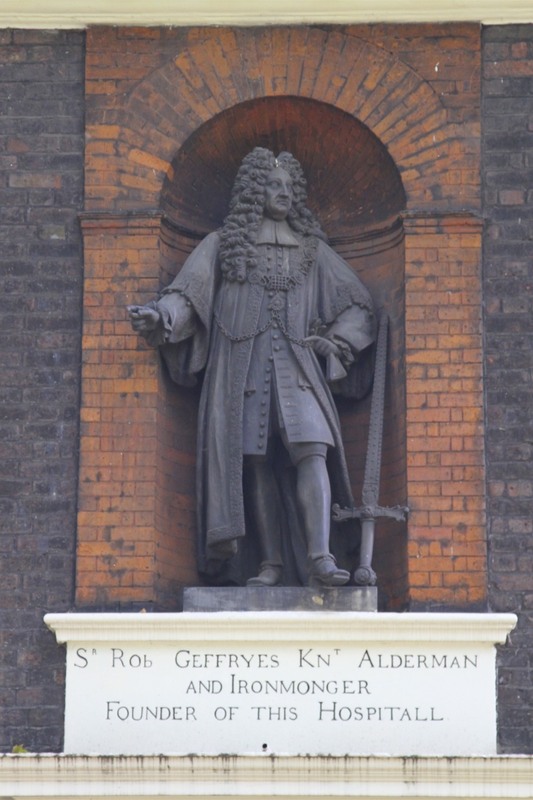 In the sixteenth century they ground flour to provide bread to London; by the seventeenth century they were grinding grain for use in the distilling of gin to supply the city’s notorious ‘Gin Palaces’. The gin business was successful: they were still producing it in 1941, when production had to stop due to grain shortages during the Second World War. Plodding along the Lee Navigation, you’ll soon reach Bow Locks and eventually arrive in Limehouse Basin. 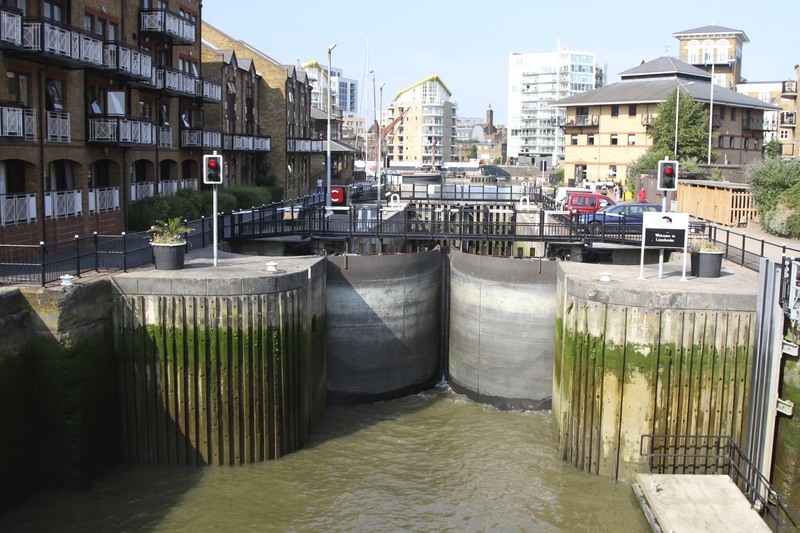 It is here that the River Thames is connected to the canal system in east London by a set of giant locks. 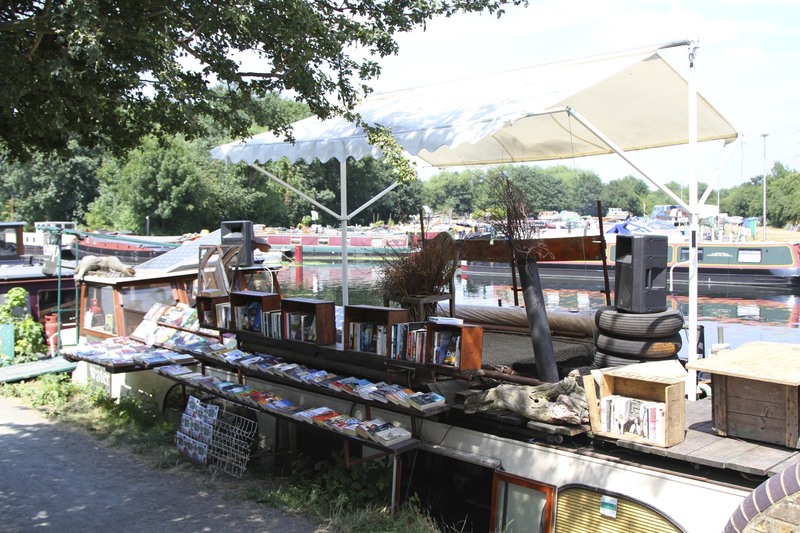 Occasionally, you’ll see small canal boats motoring along the River Thames between Limehouse Basin and the Grand Union Canal, which intersects with the Thames in west London. East London is truly an extraordinary place. 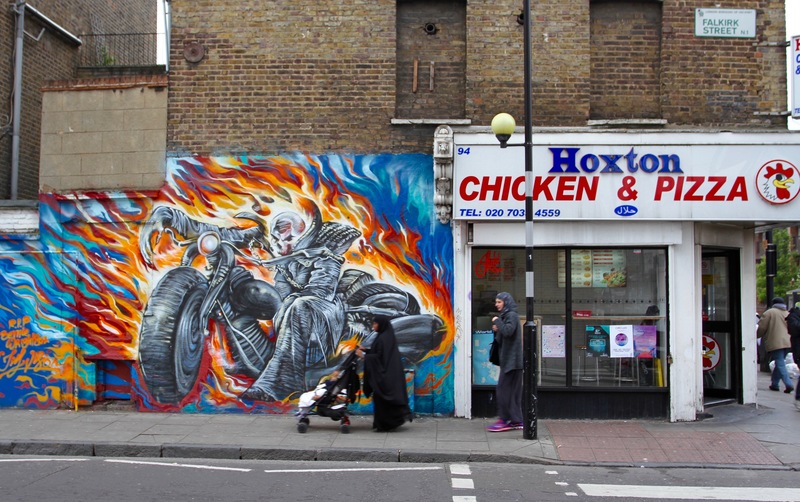 I’ve spent a dozen years living in the area around Hoxton, in that time it has been transformed in a way that is barely credible. 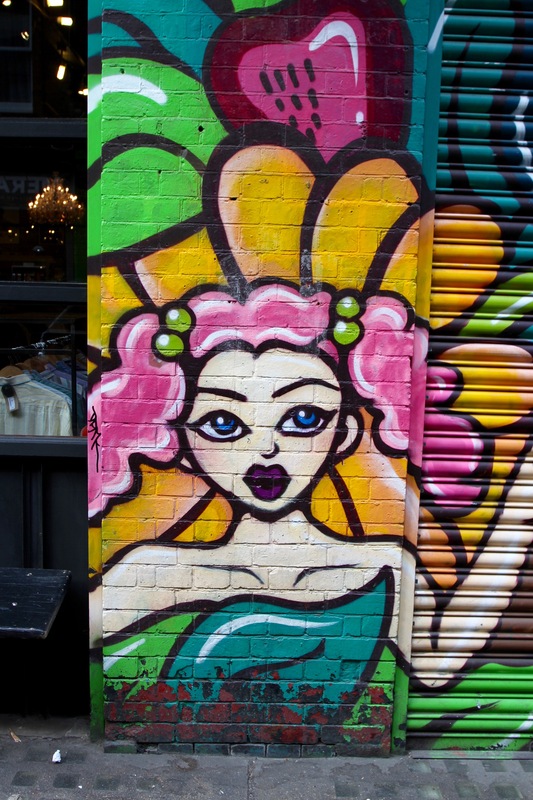 Although it retains some of its working class industrial heritage, the area has been consumed by a avalanche of fashionableness, making it the destination of choice for trend-minded twenty- and thirty-somethings. 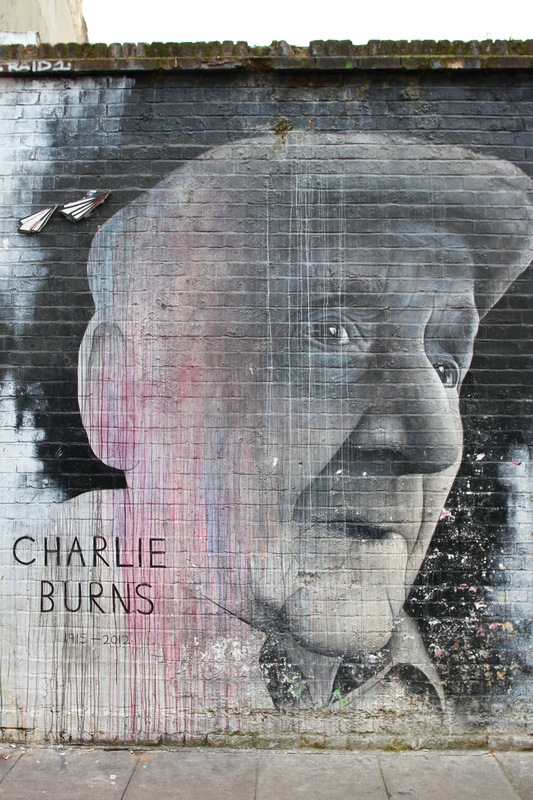 The area’s development into the uber-fashionable began with the arrival of a new generation of young British artists, drawn to its large and affordable (at the time) warehouse spaces. This was followed by waves of bankers and financiers (it is very close to the financial heart of the city), and, most recently, high-tech and media industries. The remarkably ugly roundabout at Old Street has been given the title The Silicon Roundabout – London’s version of Silicon Valley. 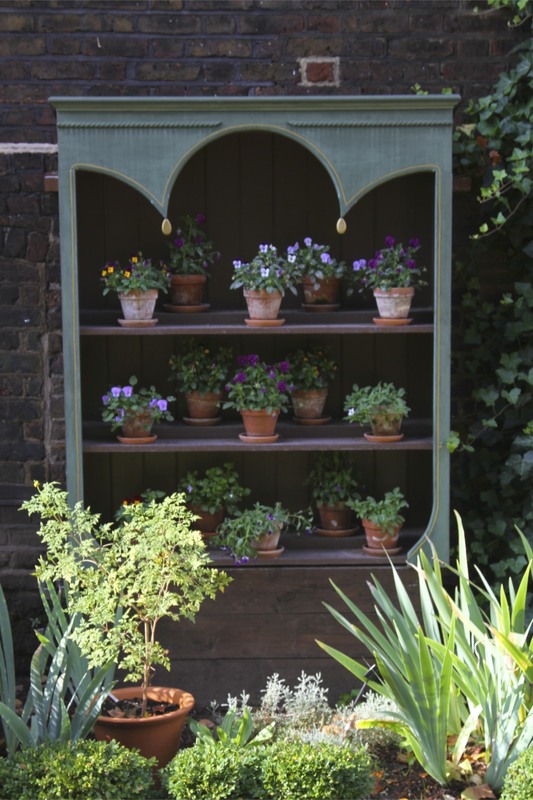 Areas that were once a bit run down have been transformed. 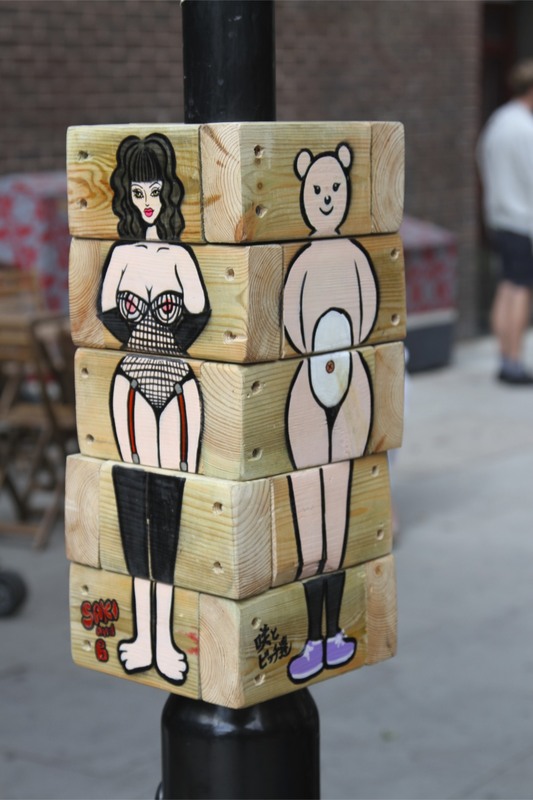 Whitecross Street is one of those places. 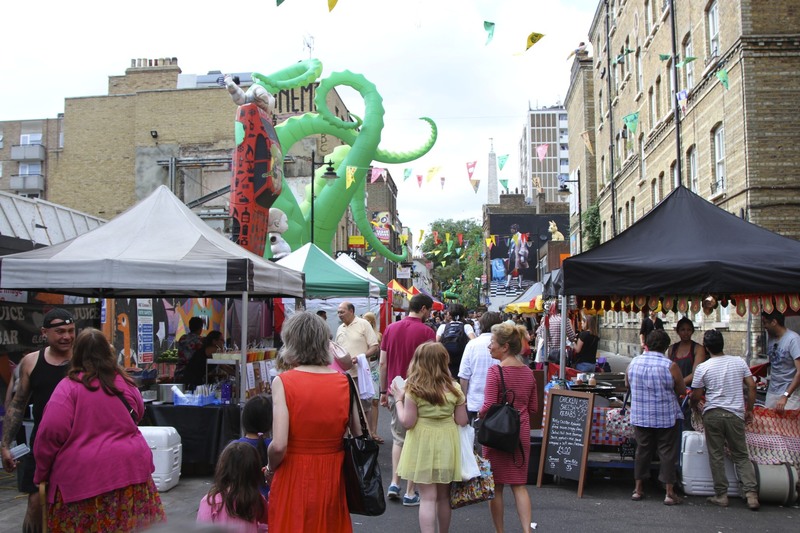 Traditionally a working class area, it has in recent years become painfully fashionable, including a fabulous weekly food market on Thursday and Friday. 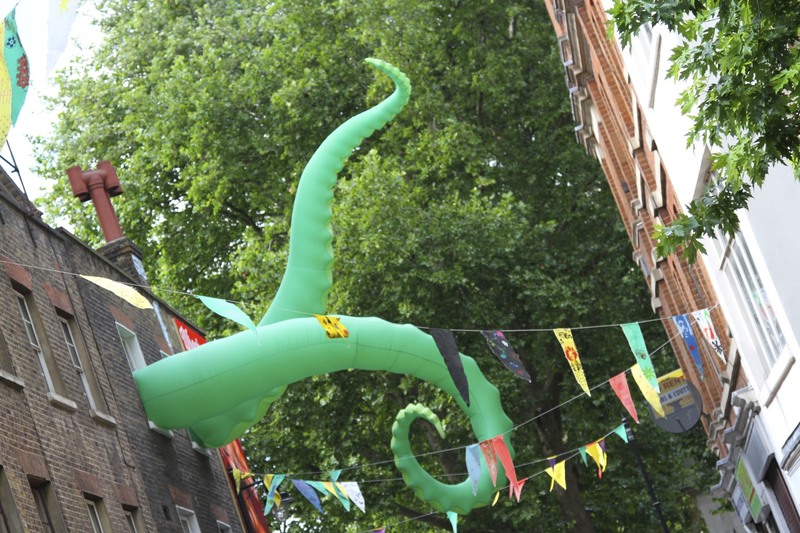 Observing the crowds at the recent Whitecross Street Party only reinforced that reality. 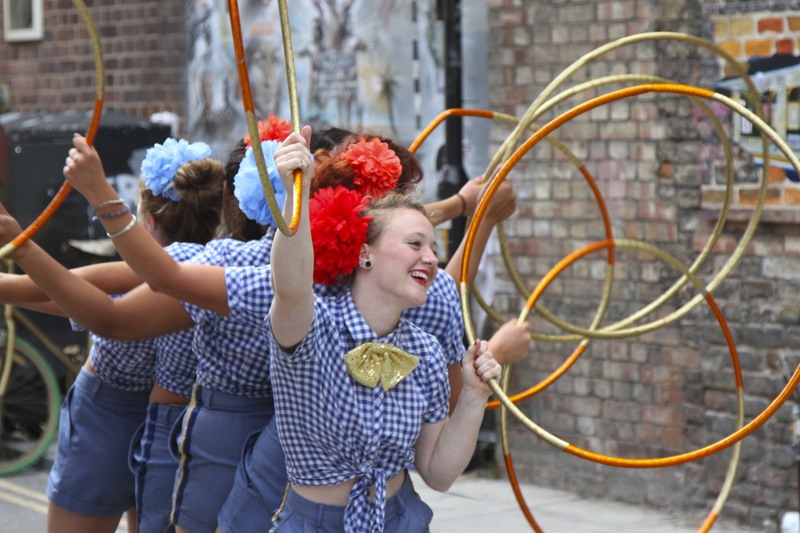 It was a pastiche of a traditional British street party, all a bit retro and tongue-in-cheek, but really good fun, with lots of music and food. The first thing we came across, wedged into a side street between Local Authority housing estates, was a duo doing a spoof of a local radio station ‘roadshow’. To say their retro hip-hop moves were daring, is an understatement. It was as excruciating as watching your aunt and uncle body-popping at a family gathering. 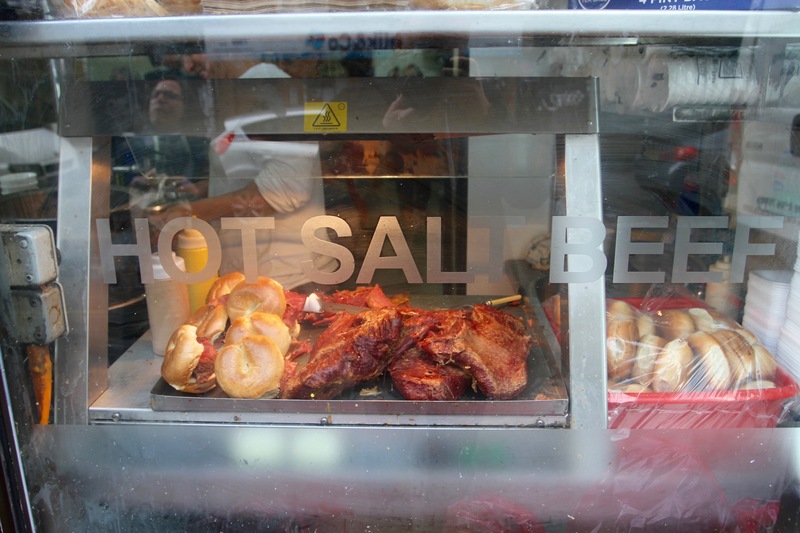 I particularly liked the radio station’s claim of being Radio so local you can smell it. It was all a bit hip-hop panto. Brilliant. Walking a little further down the street we found ourselves drawn towards a crowd of people. 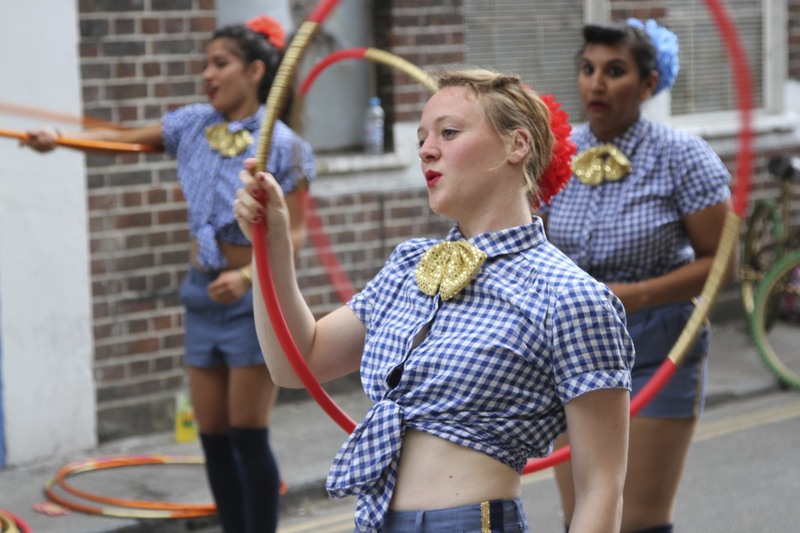 As we joined the throng a troupe of quirky hula hoopers started to hula their way around another side street. You had to be there, it was hilarious – 1920s Hollywood done with a smile and an ironic shimmy. It seems like this sort of event happens all the time these days, attracting a diverse crowd of Londoners and tourists. For once the weather played along, with temperatures reaching 30 Celcius. 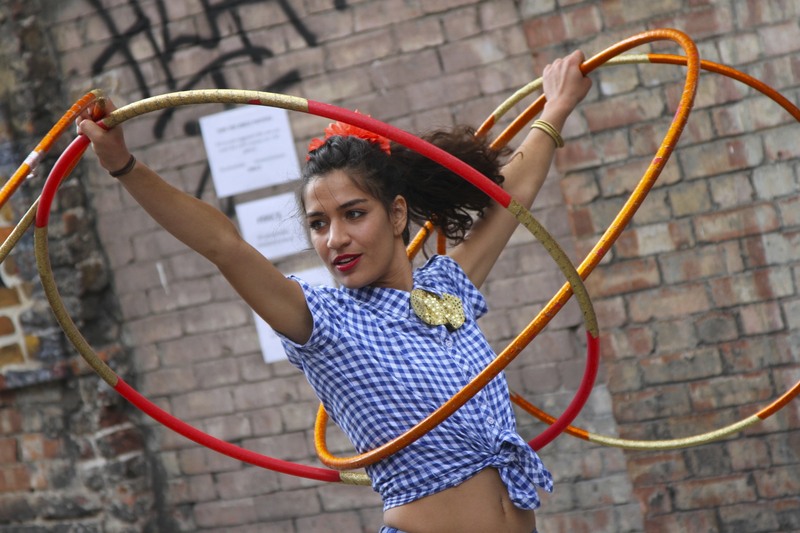 Hot work for hula hooping. 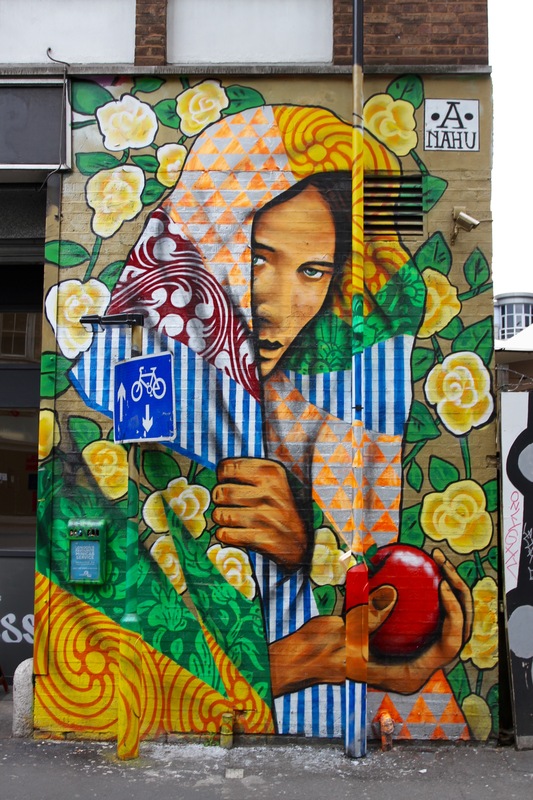 Whitecross Street is an area where street art doesn’t just flourish, it is encouraged and patronised. 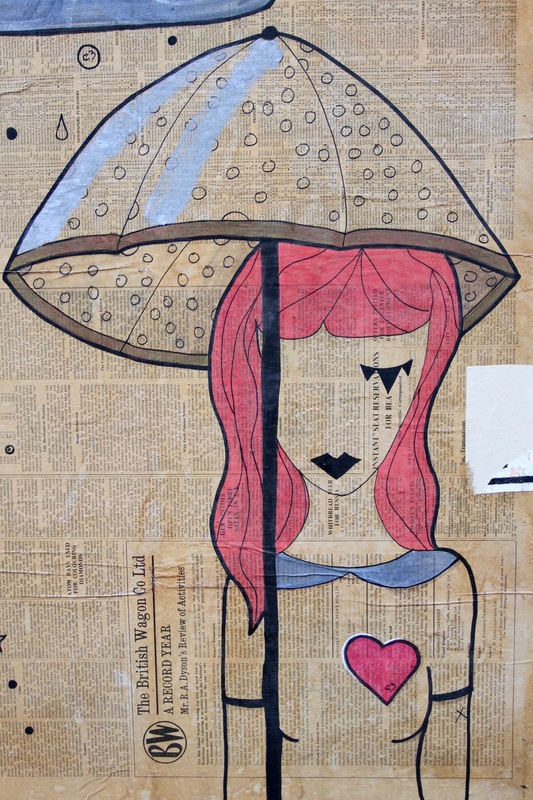 There are some permanent street art ‘displays’ as well as more recent wall art. Not surprising then that there was a street art installation during the street party. 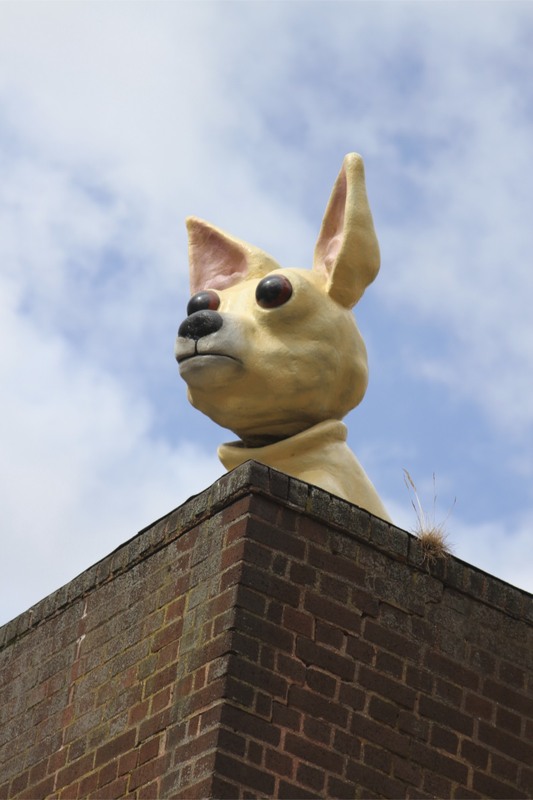 I love the giant nodding dog peering over the top of a building.